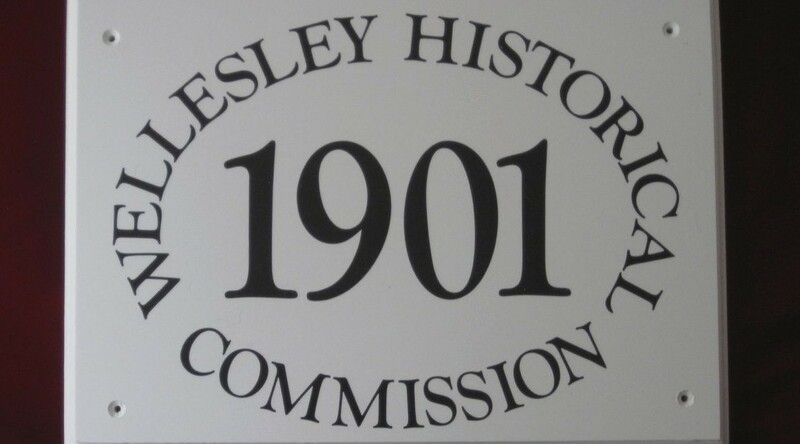 One of the most important ways in which the Historical Commission promotes awareness of the Town of Wellesley’s history is through its plaque program. 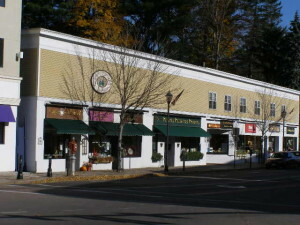 The original Historical Commission plaque program was established in conjunction with the National Bicentennial and Town Centennial celebrations in 1976 and 1981, respectively. 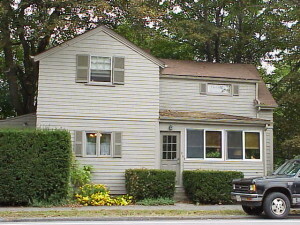 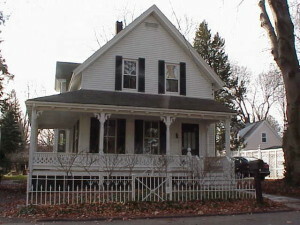 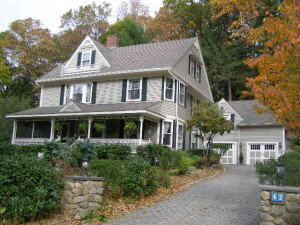 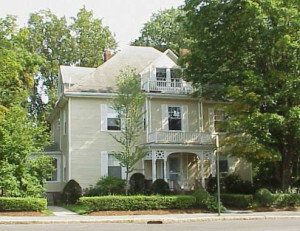 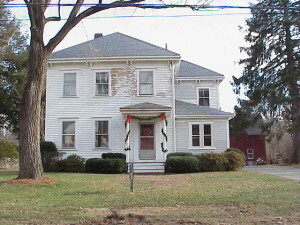 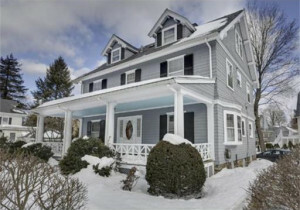 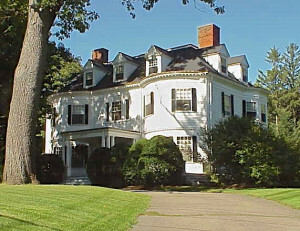 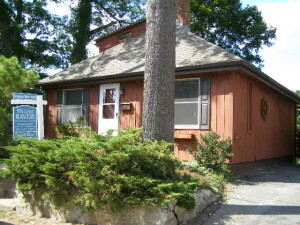 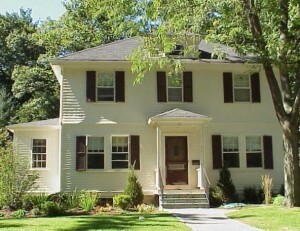 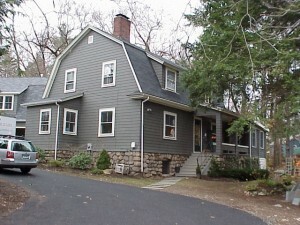 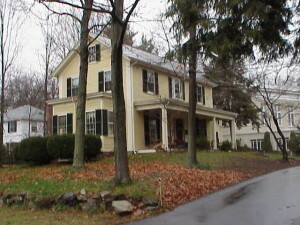 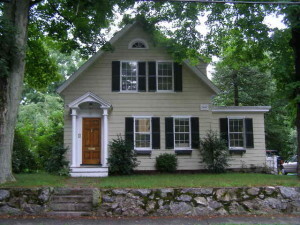 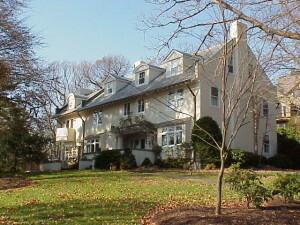 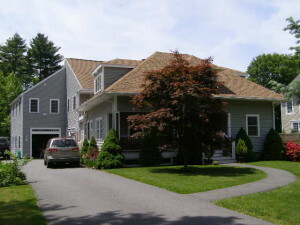 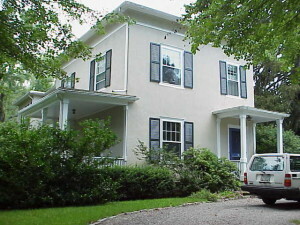 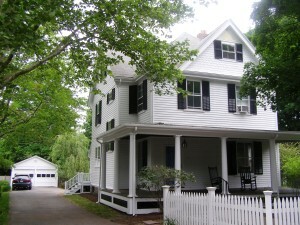 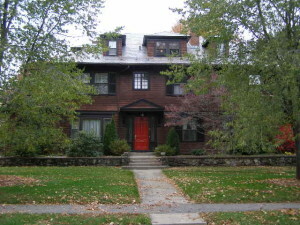 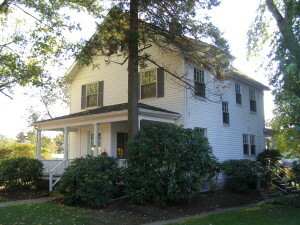 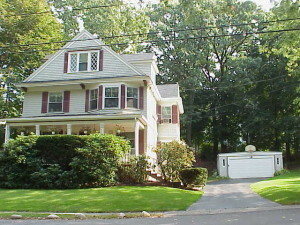 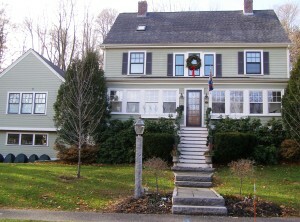 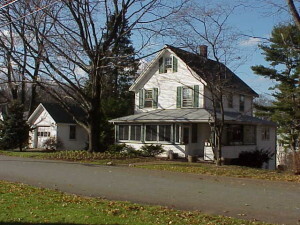 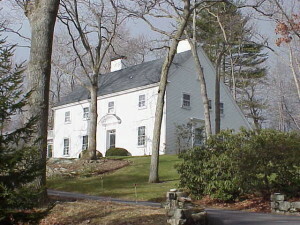 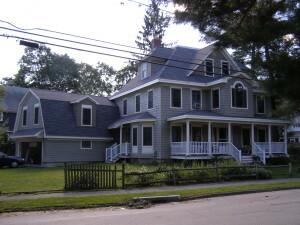 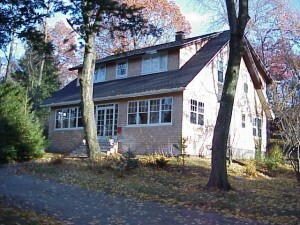 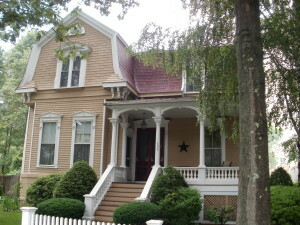 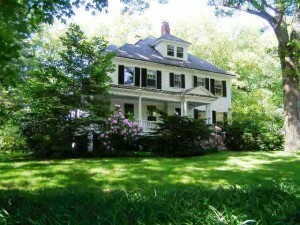 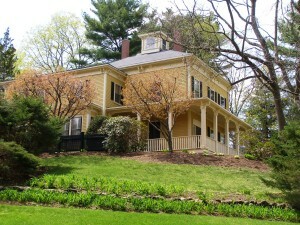 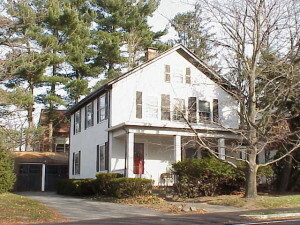 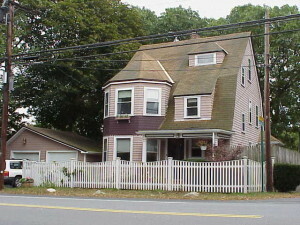 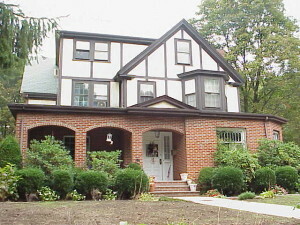 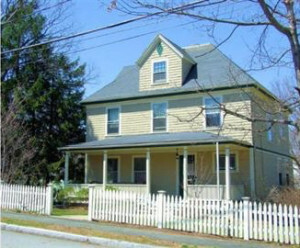 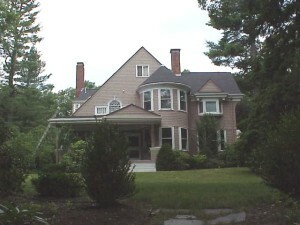 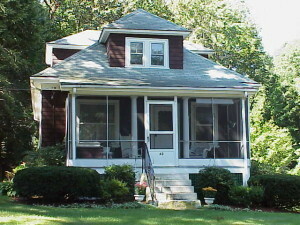 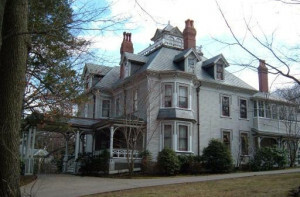 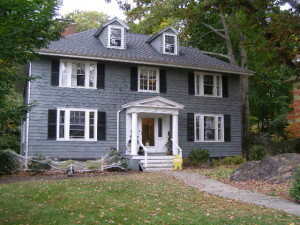 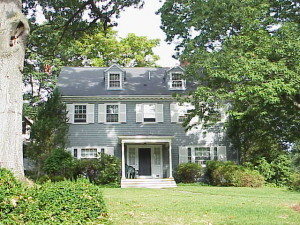 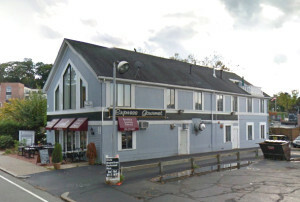 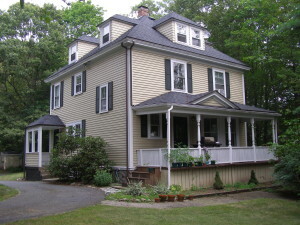 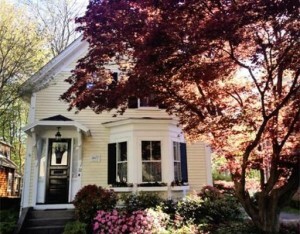 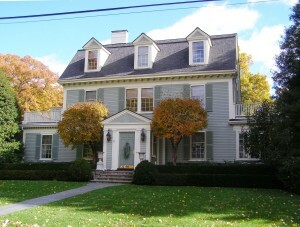 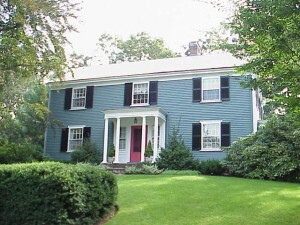 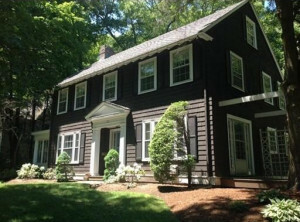 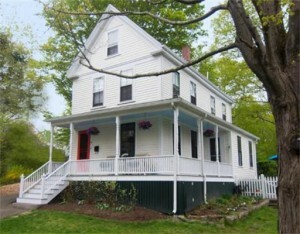 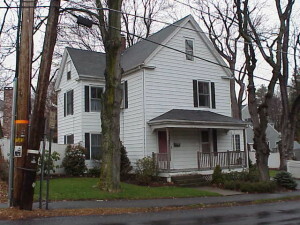 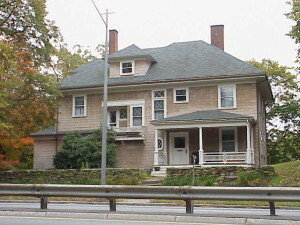 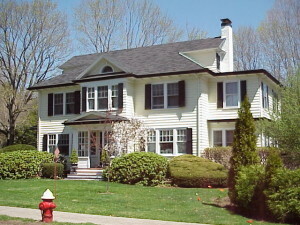 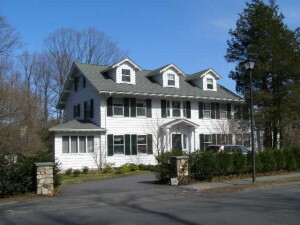 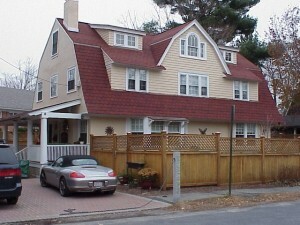 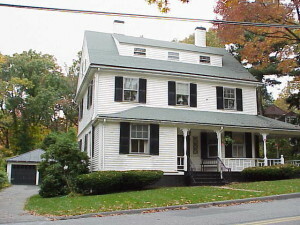 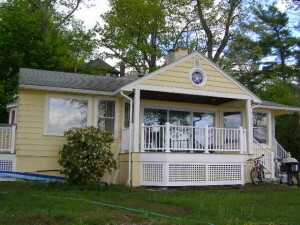 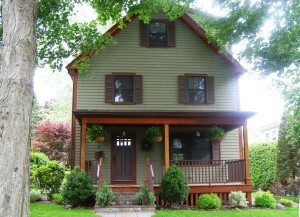 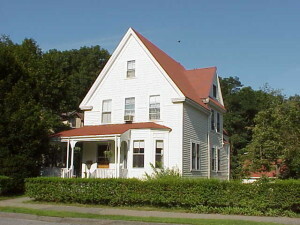 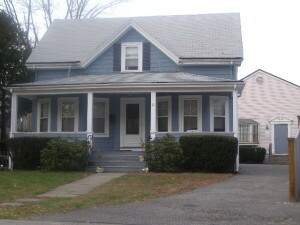 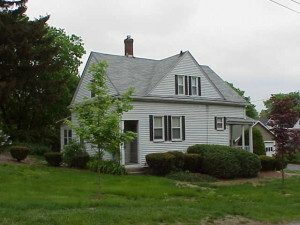 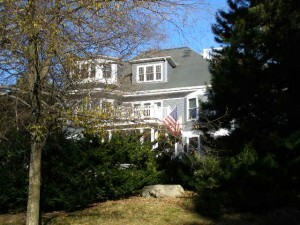 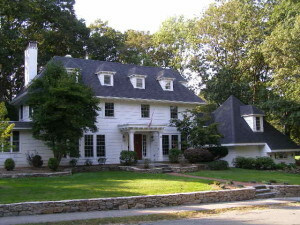 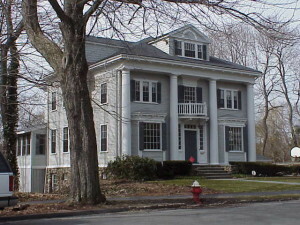 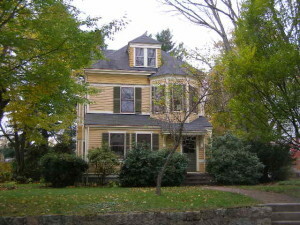 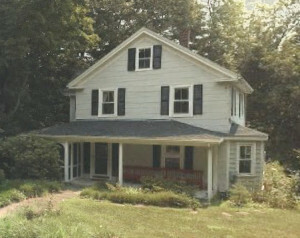 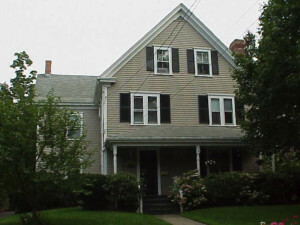 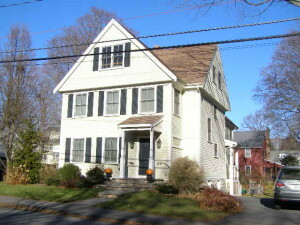 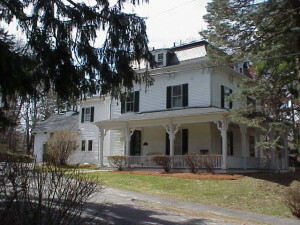 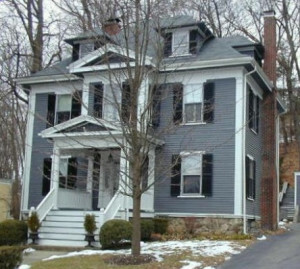 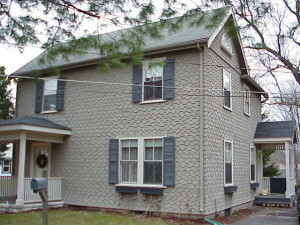 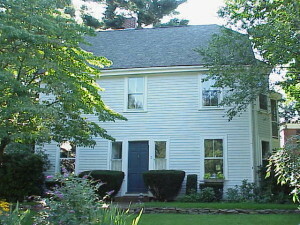 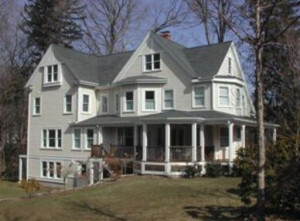 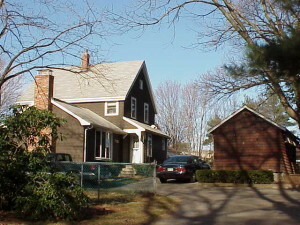 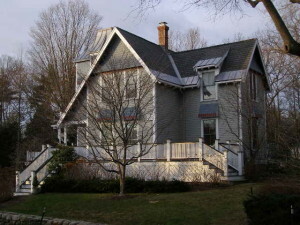 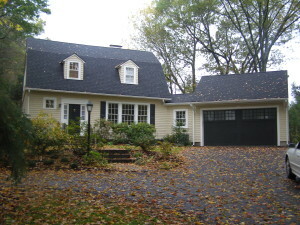 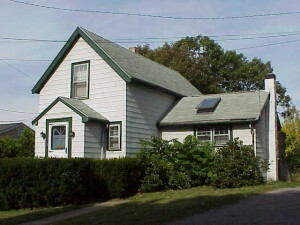 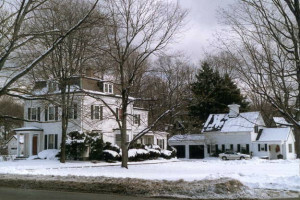 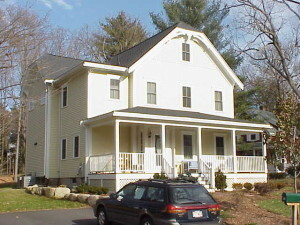 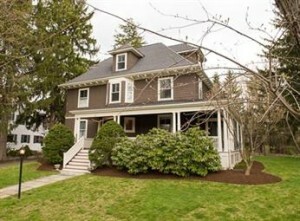 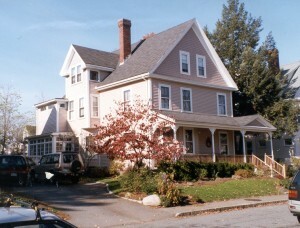 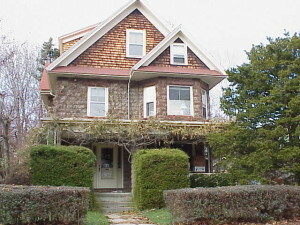 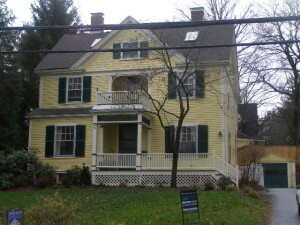 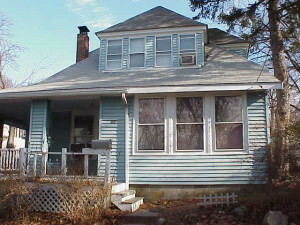 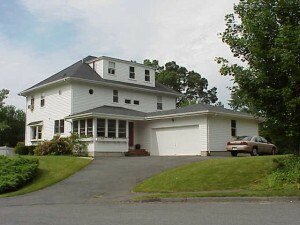 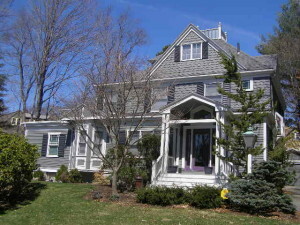 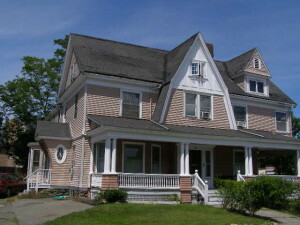 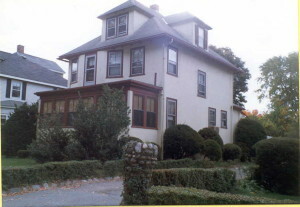 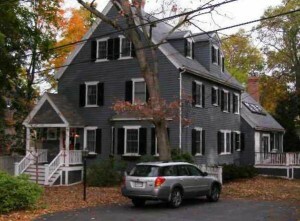 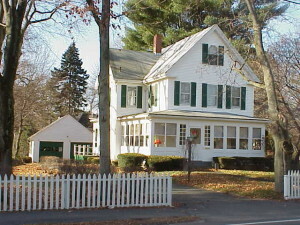 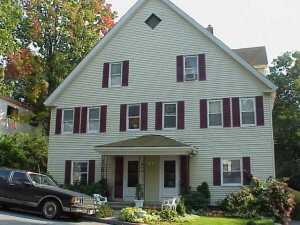 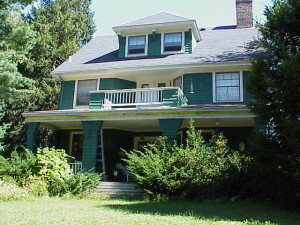 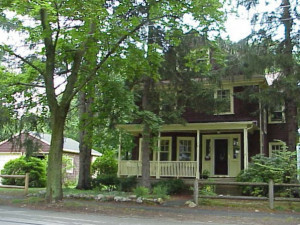 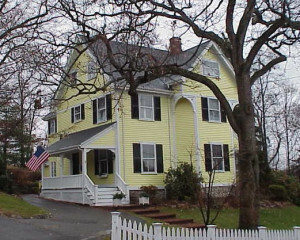 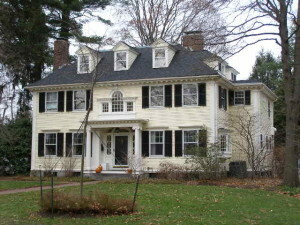 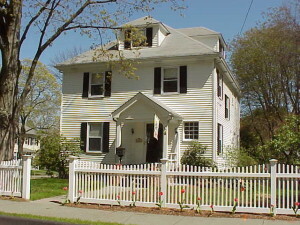 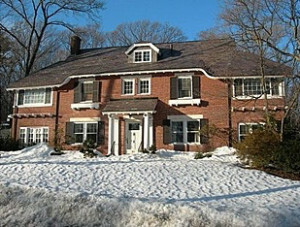 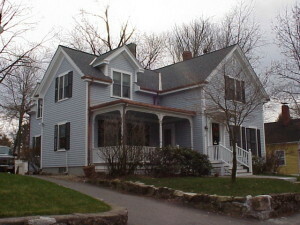 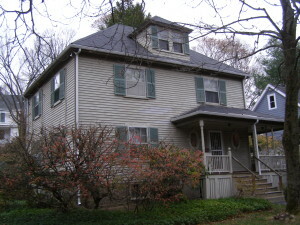 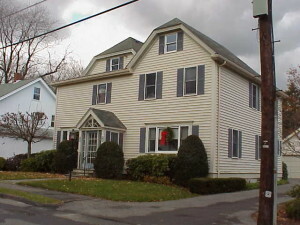 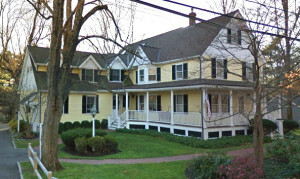 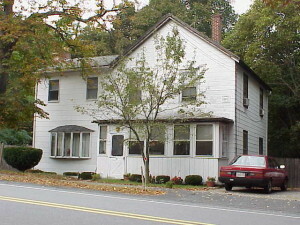 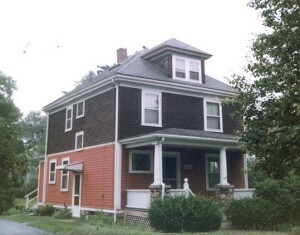 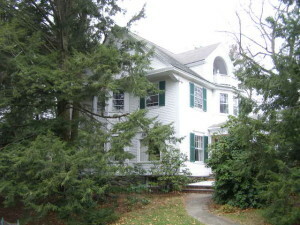 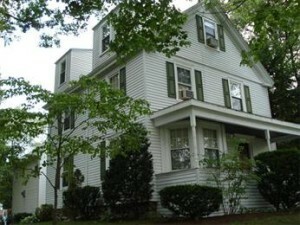 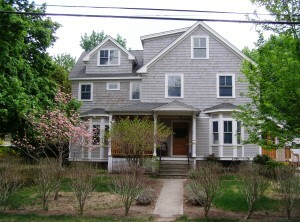 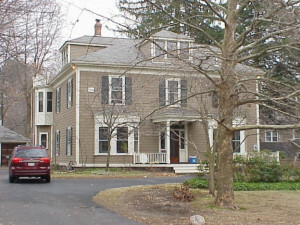 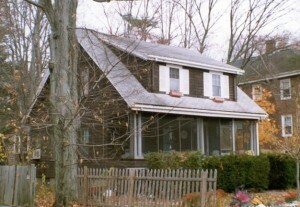 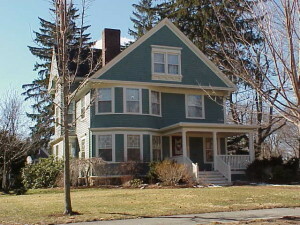 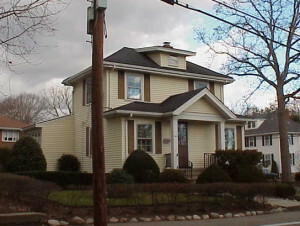 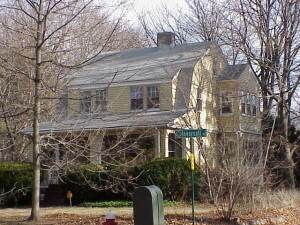 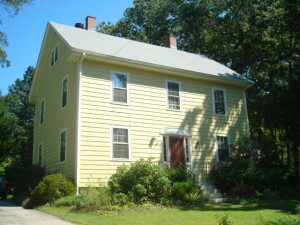 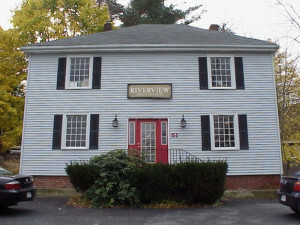 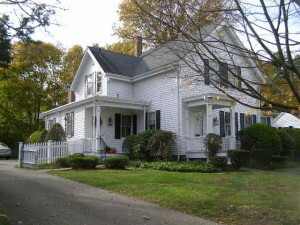 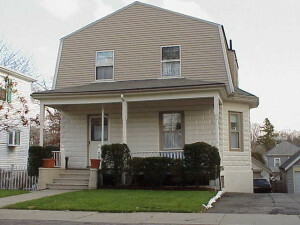 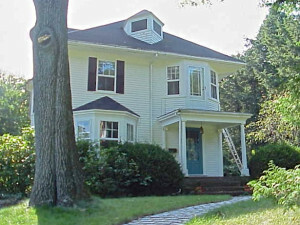 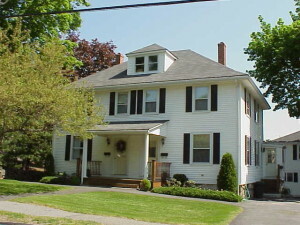 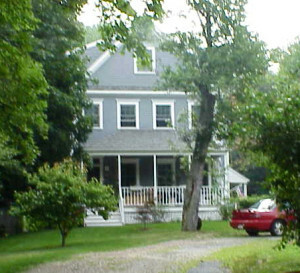 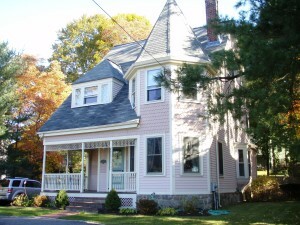 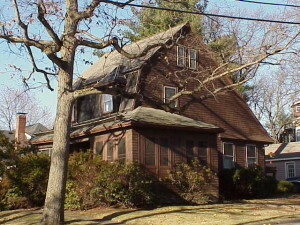 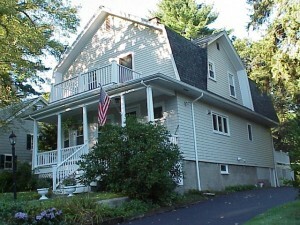 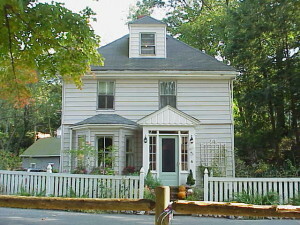 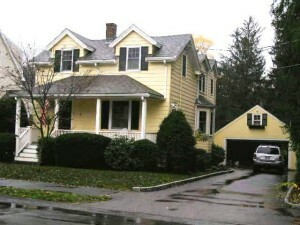 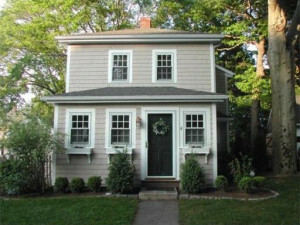 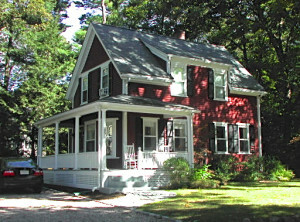 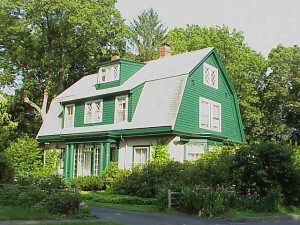 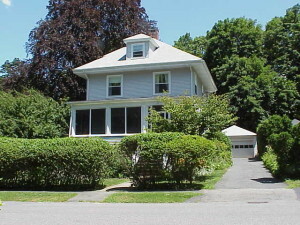 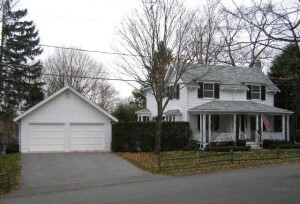 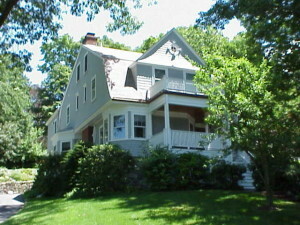 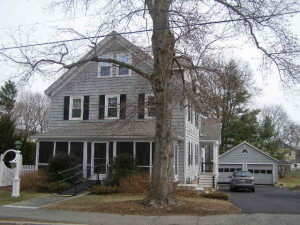 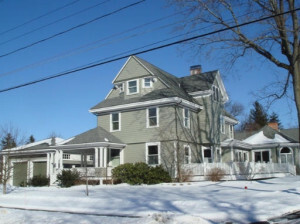 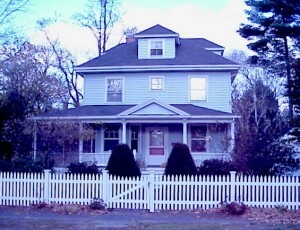 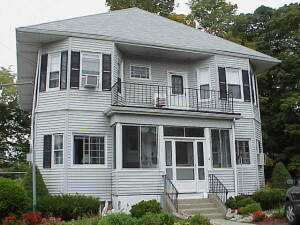 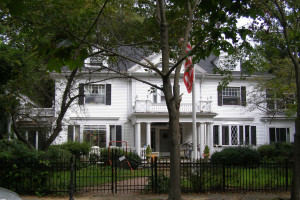 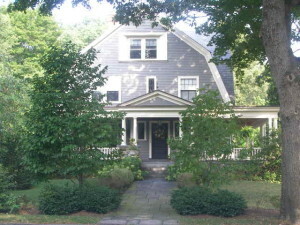 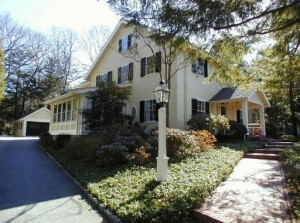 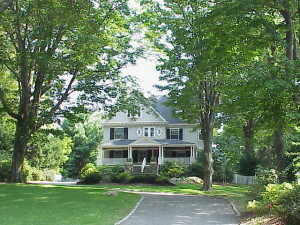 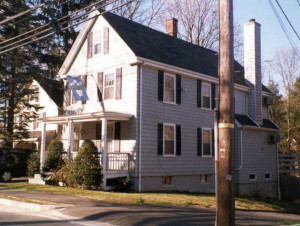 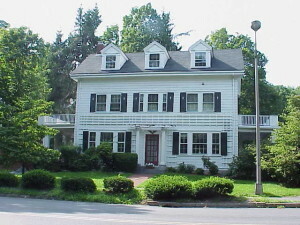 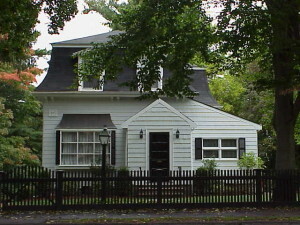 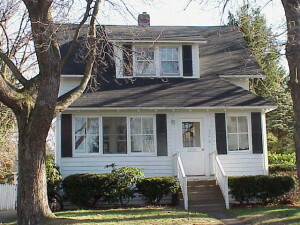 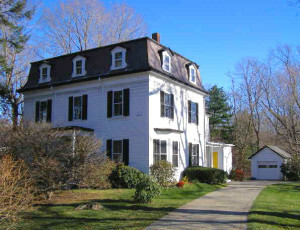 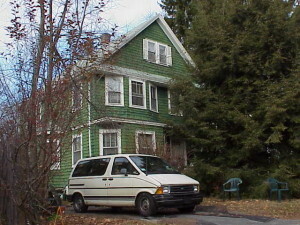 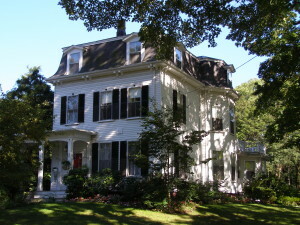 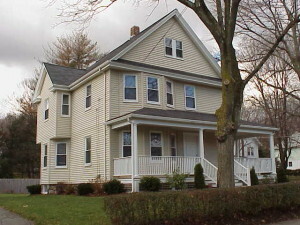 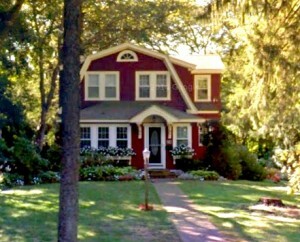 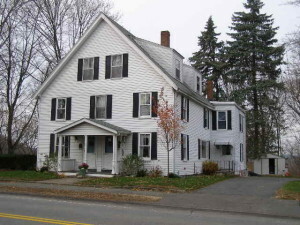 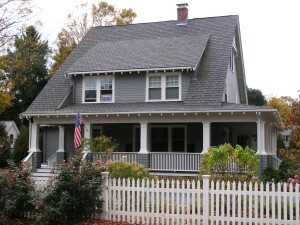 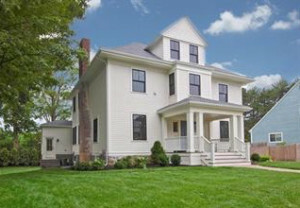 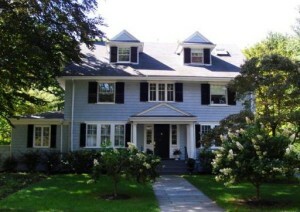 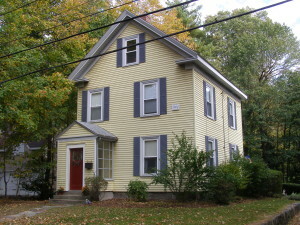 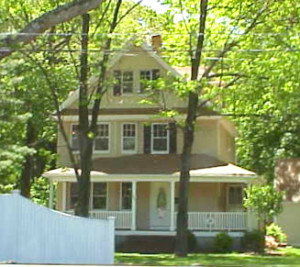 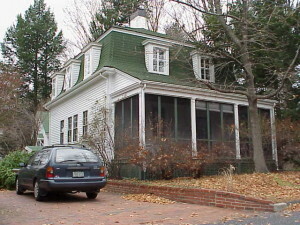 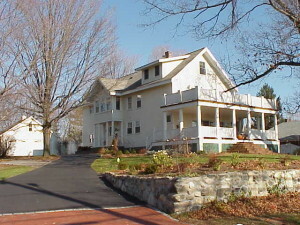 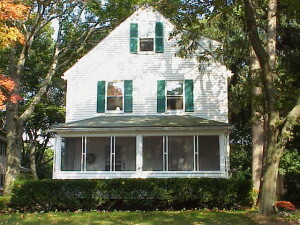 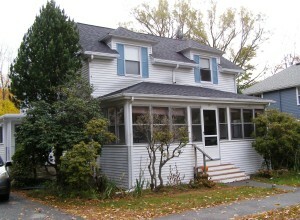 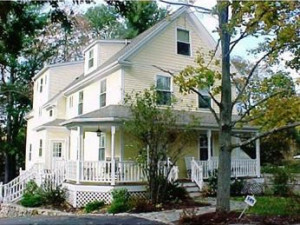 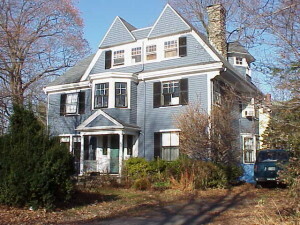 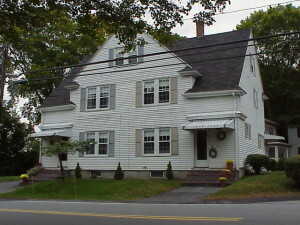 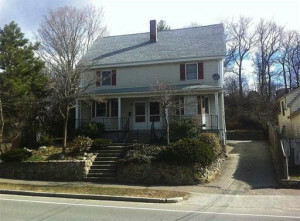 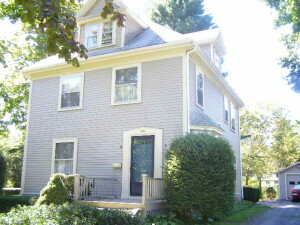 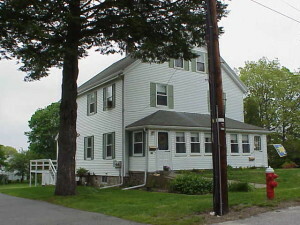 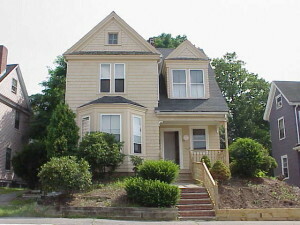 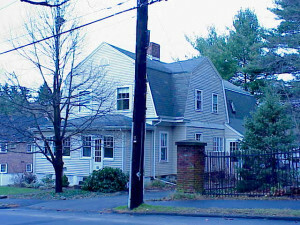 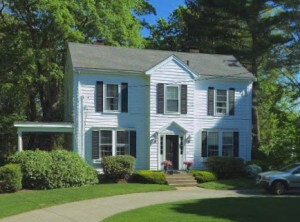 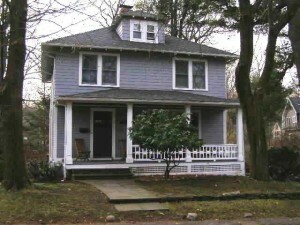 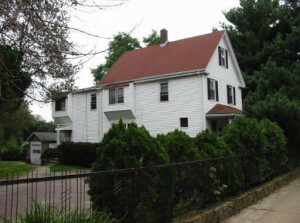 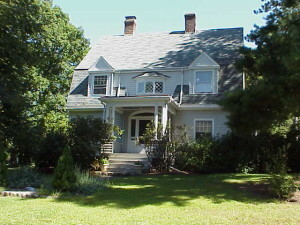 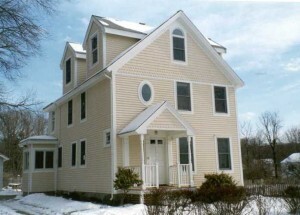 At the time, plaques were placed on almost all of the houses and buildings in Wellesley that were constructed before the Town’s incorporation in 1881. 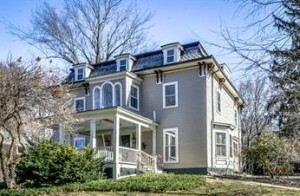 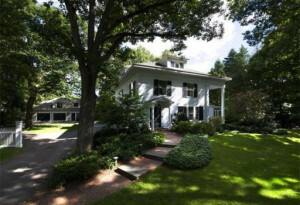 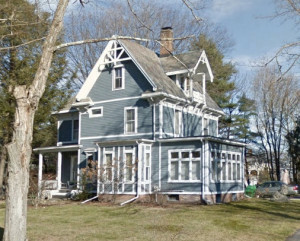 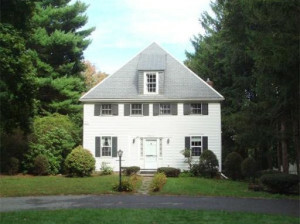 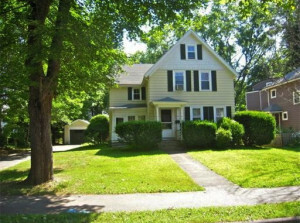 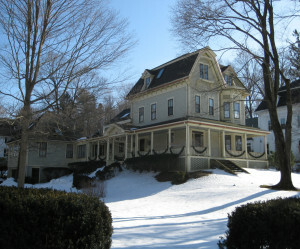 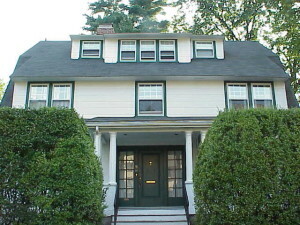 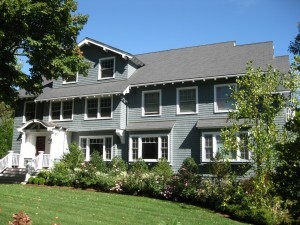 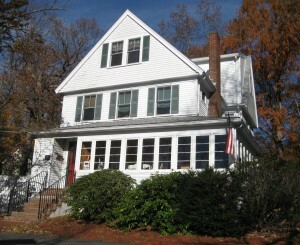 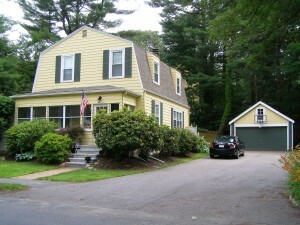 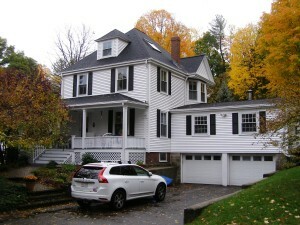 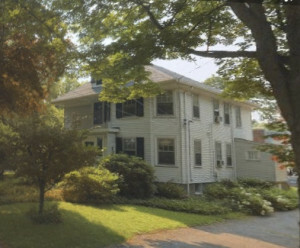 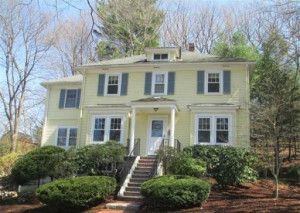 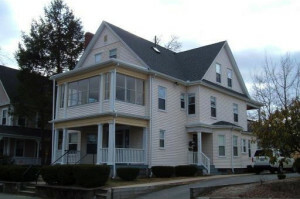 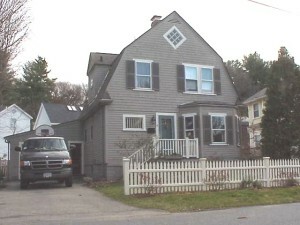 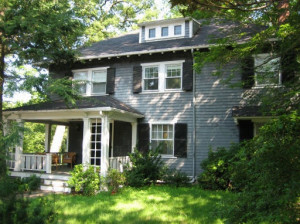 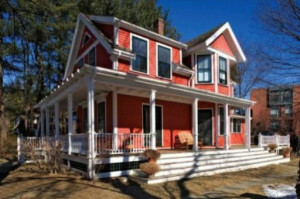 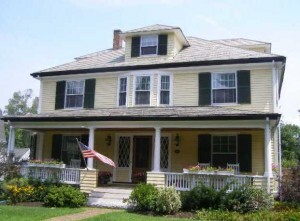 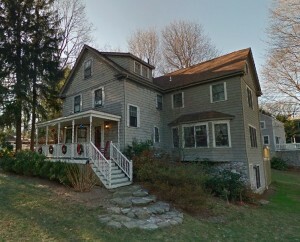 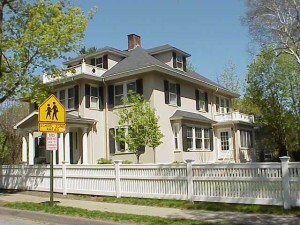 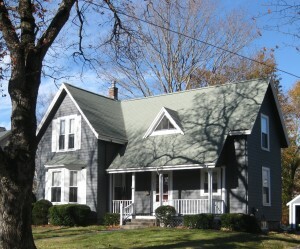 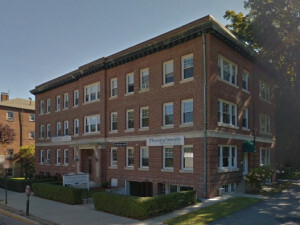 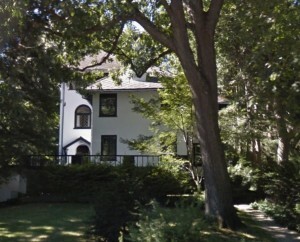 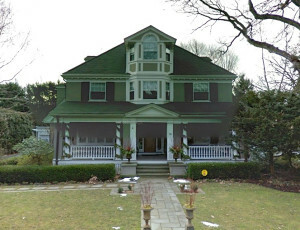 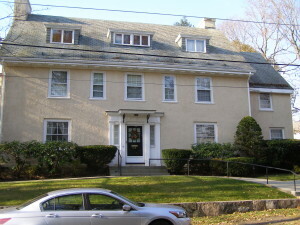 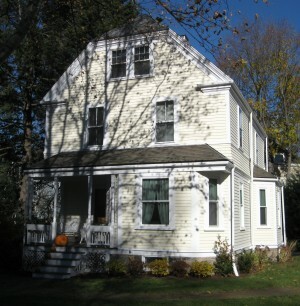 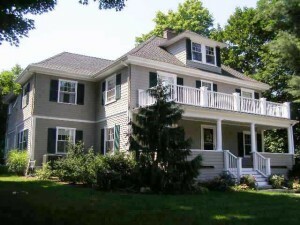 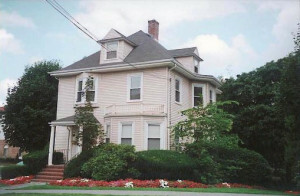 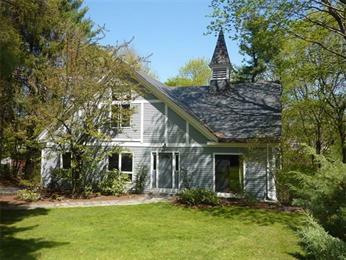 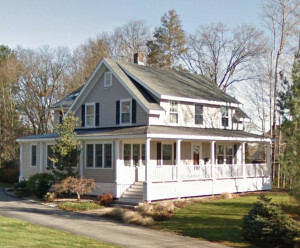 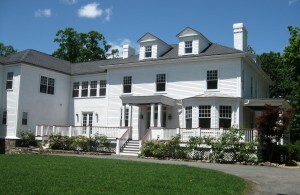 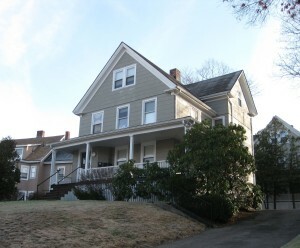 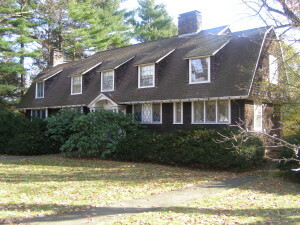 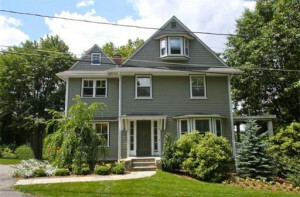 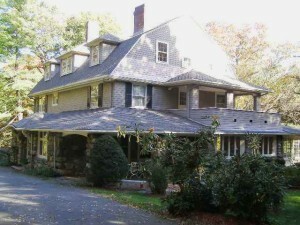 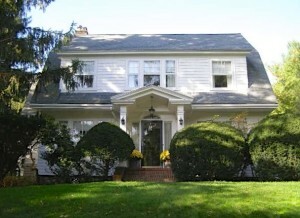 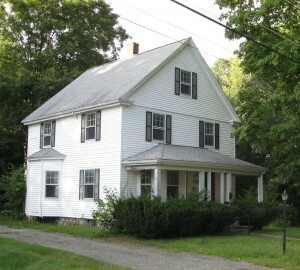 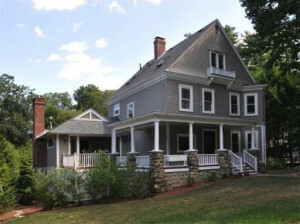 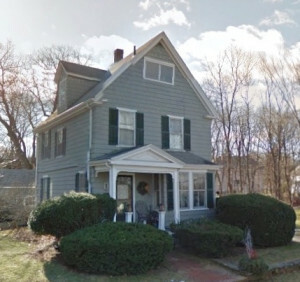 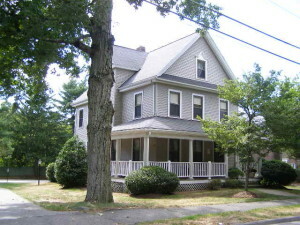 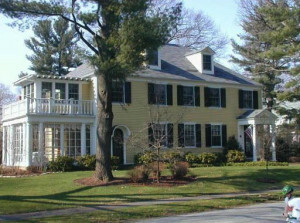 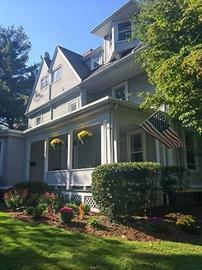 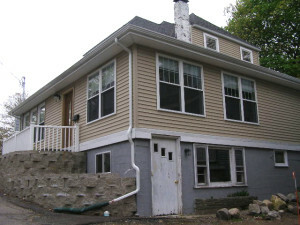 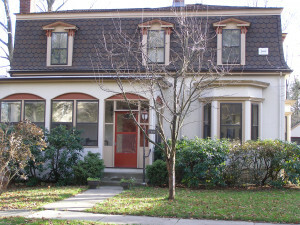 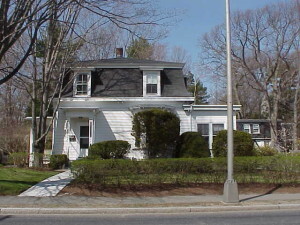 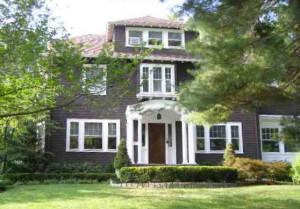 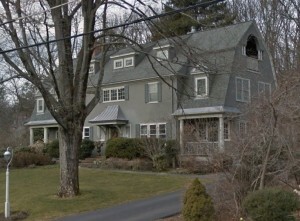 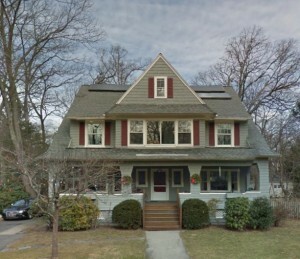 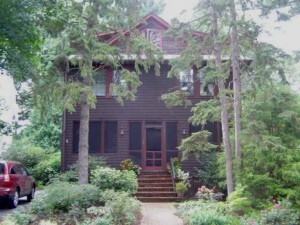 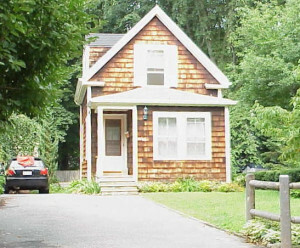 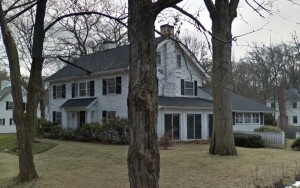 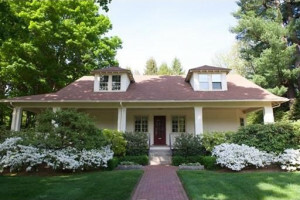 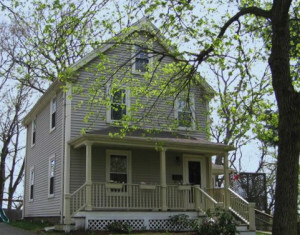 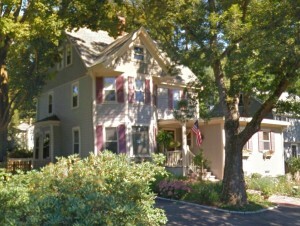 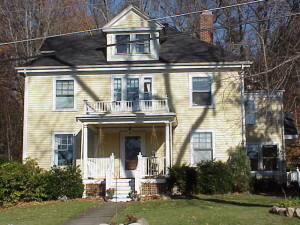 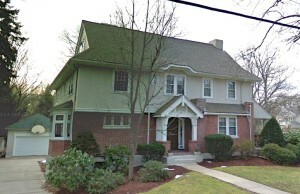 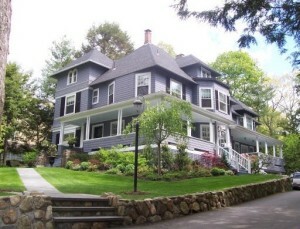 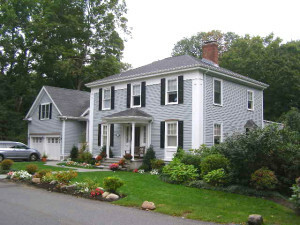 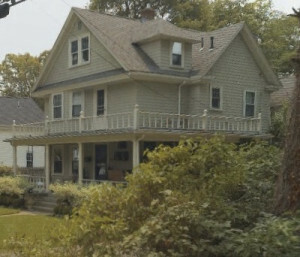 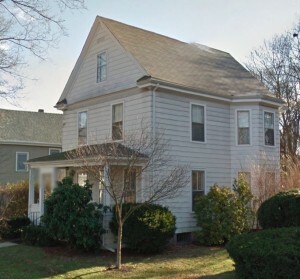 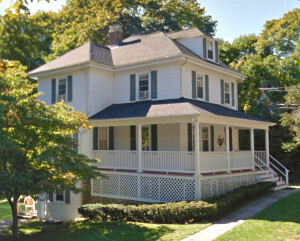 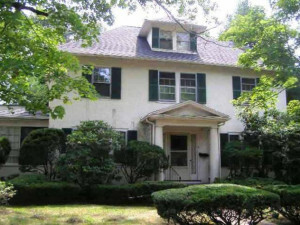 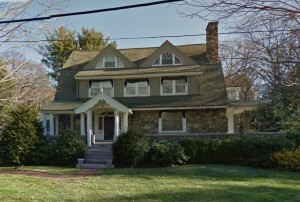 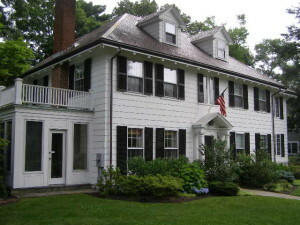 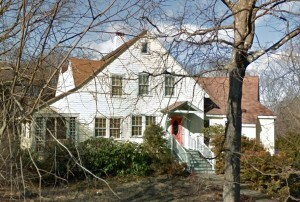 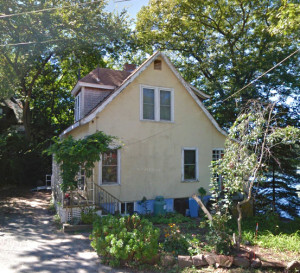 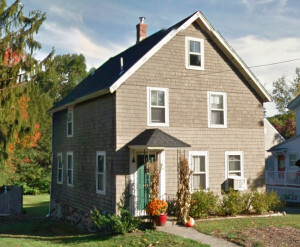 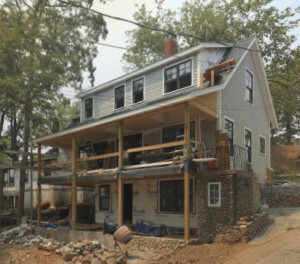 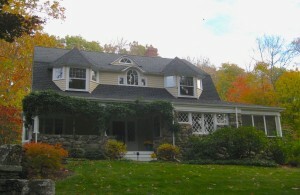 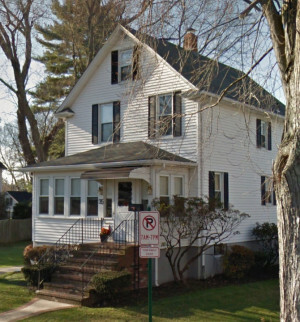 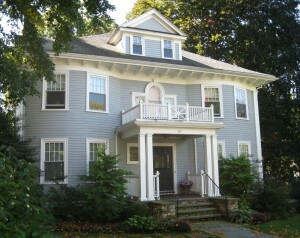 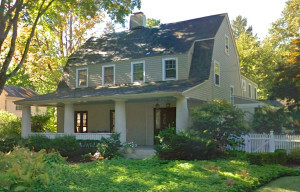 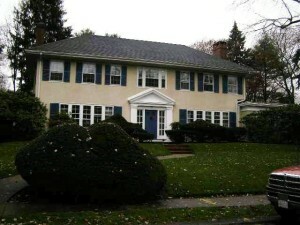 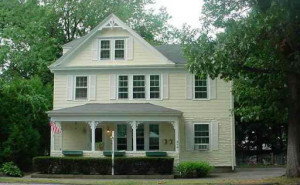 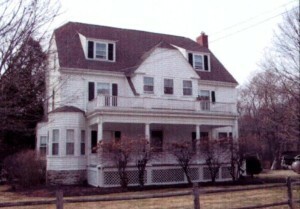 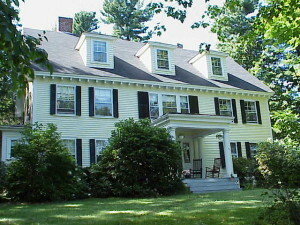 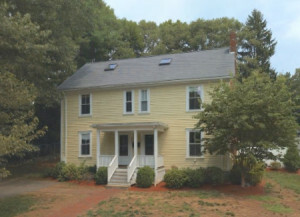 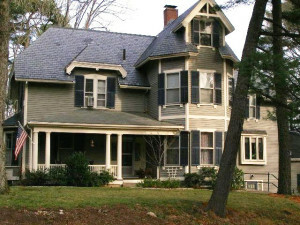 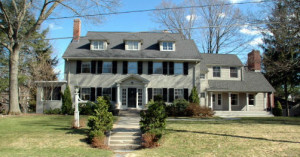 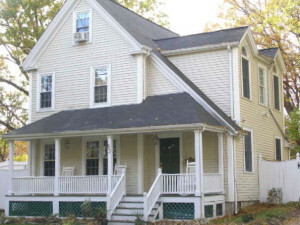 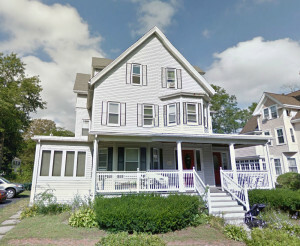 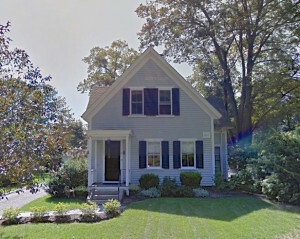 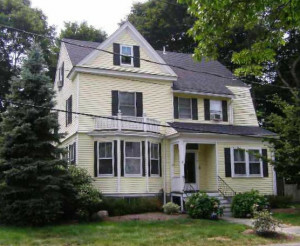 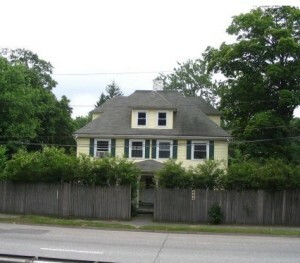 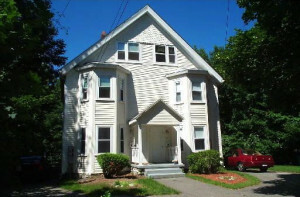 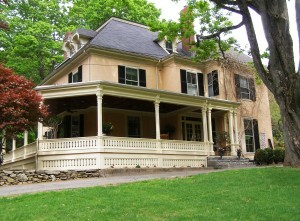 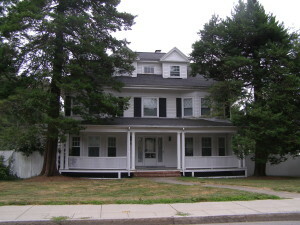 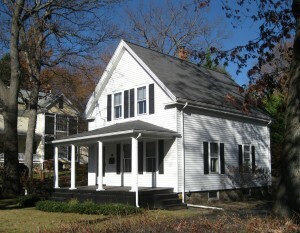 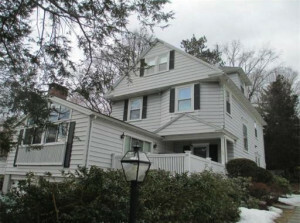 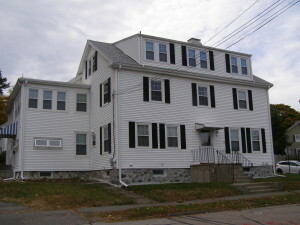 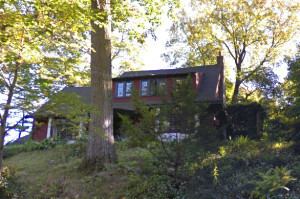 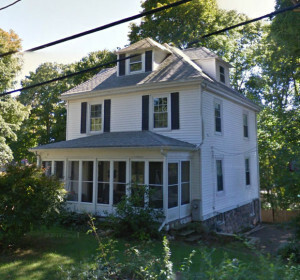 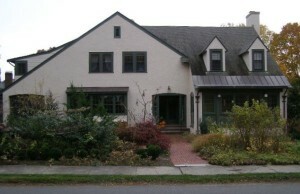 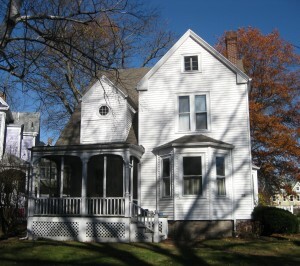 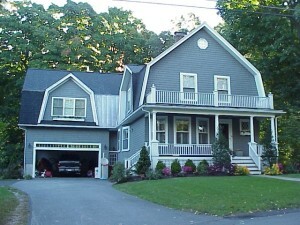 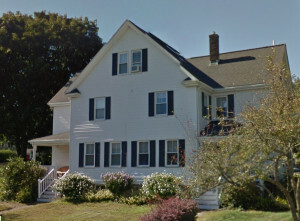 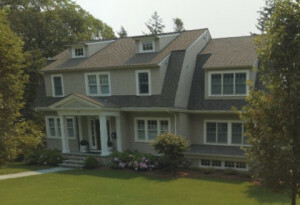 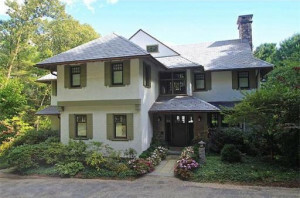 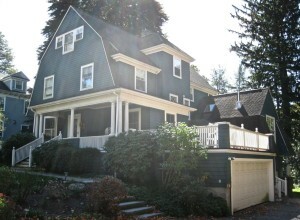 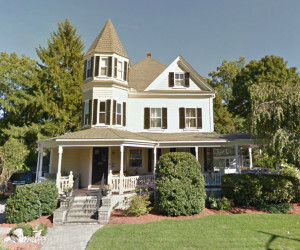 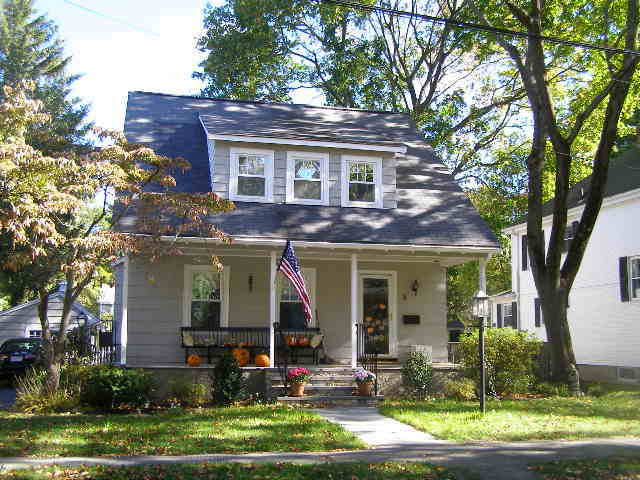 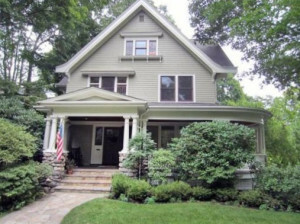 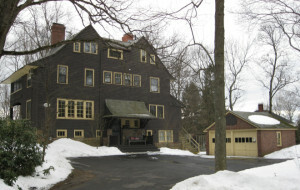 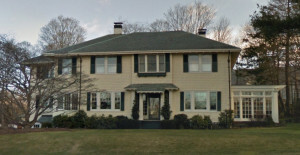 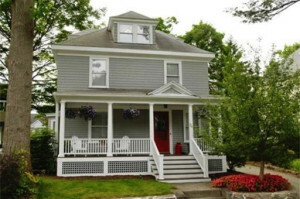 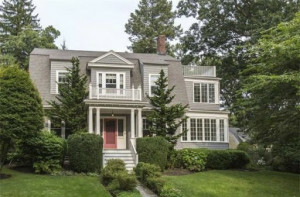 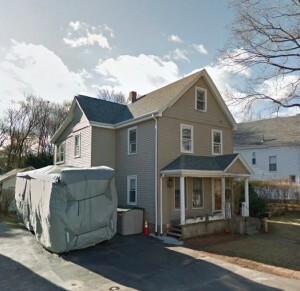 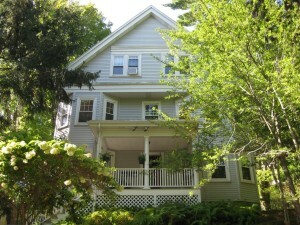 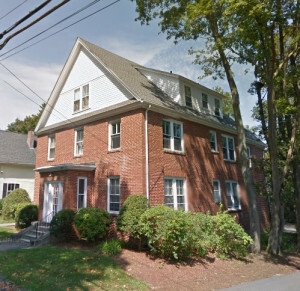 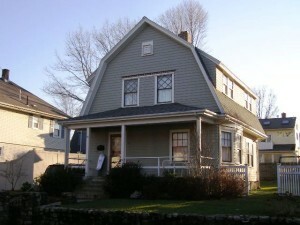 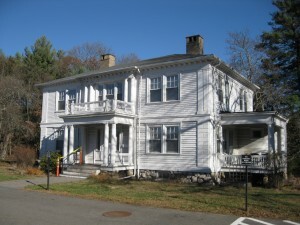 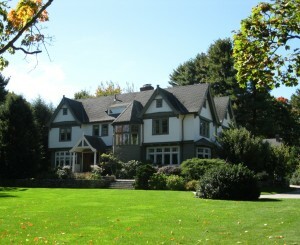 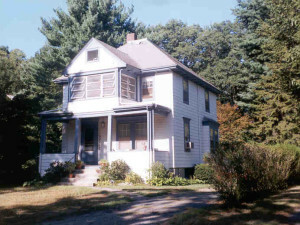 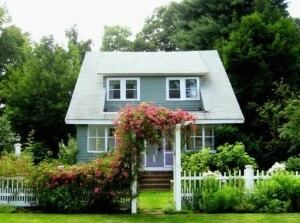 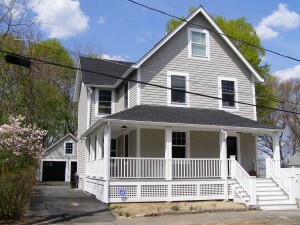 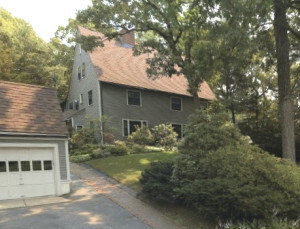 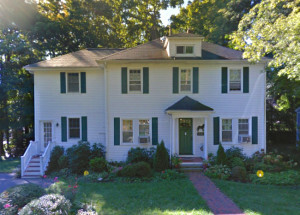 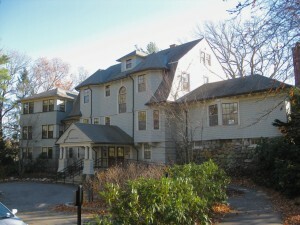 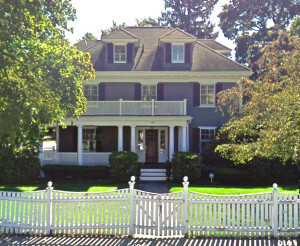 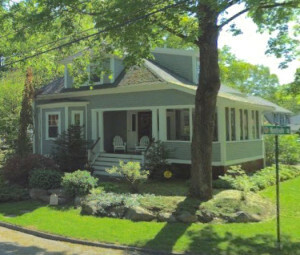 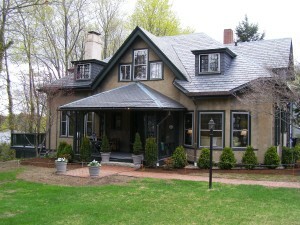 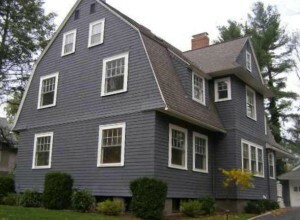 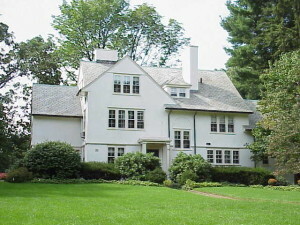 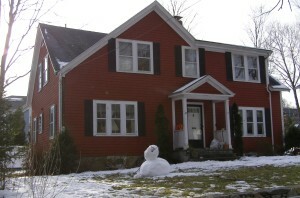 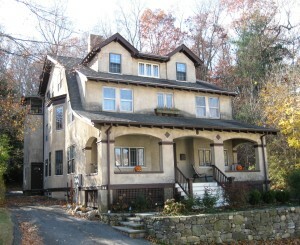 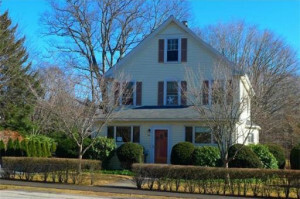 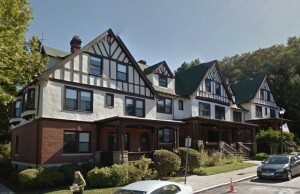 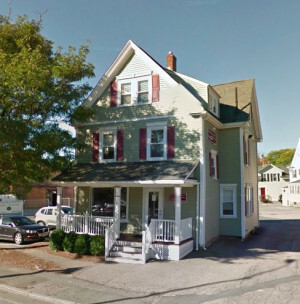 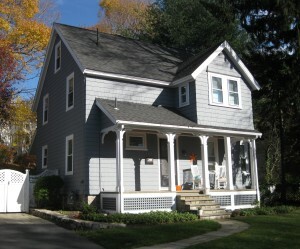 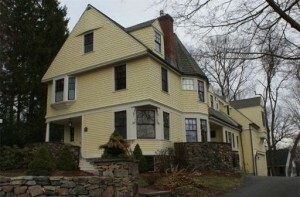 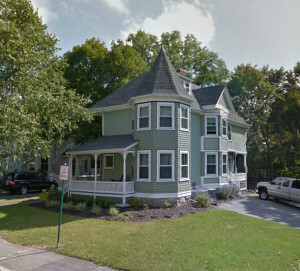 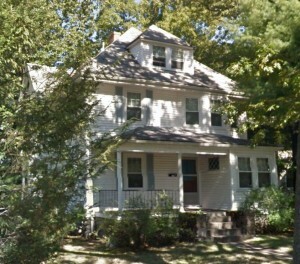 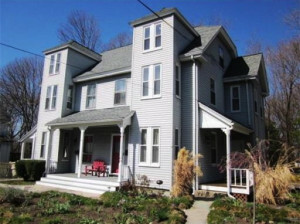 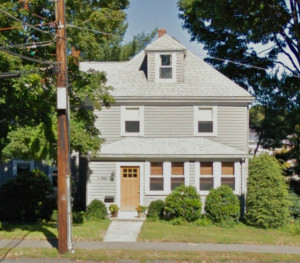 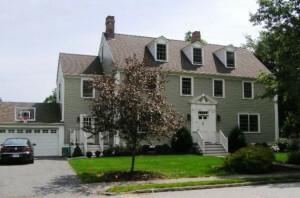 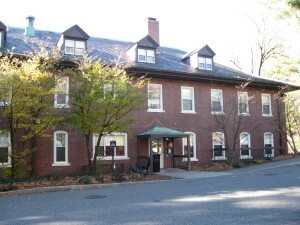 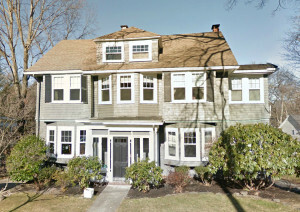 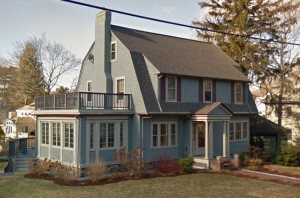 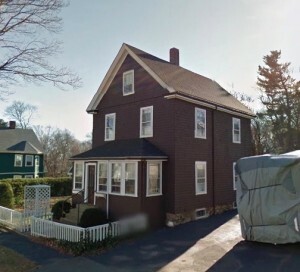 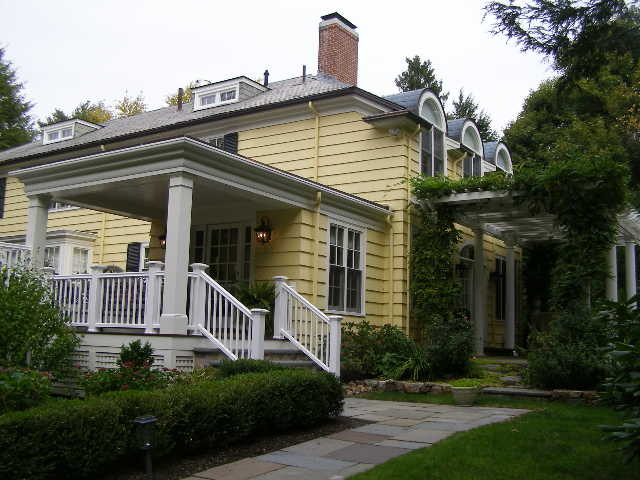 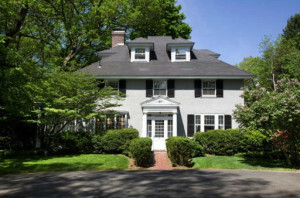 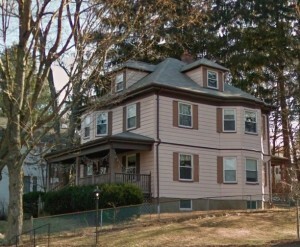 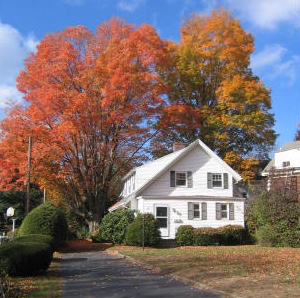 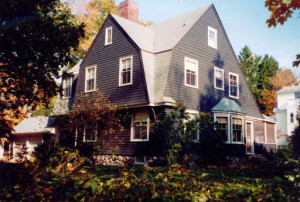 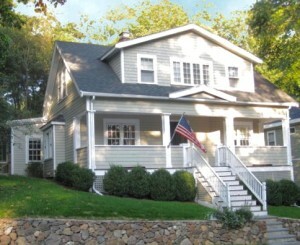 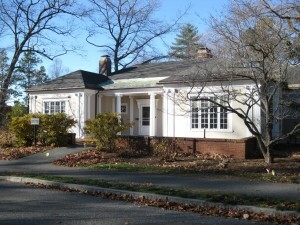 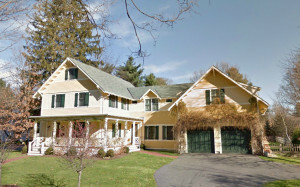 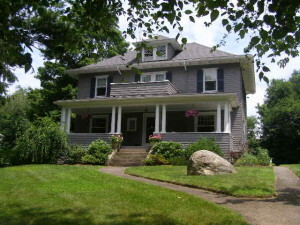 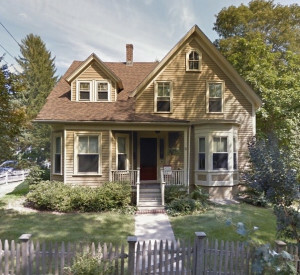 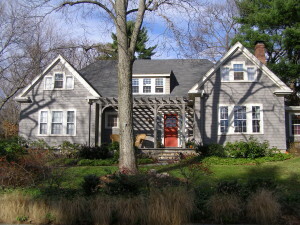 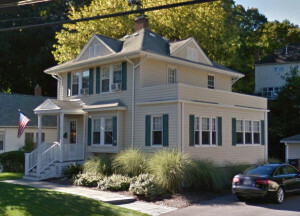 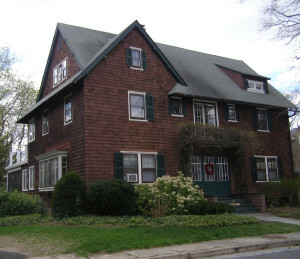 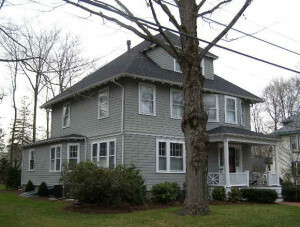 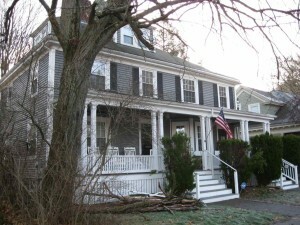 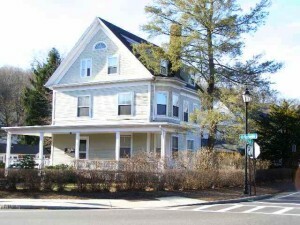 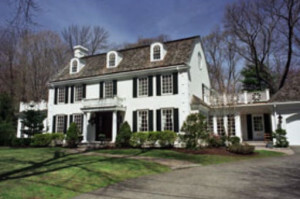 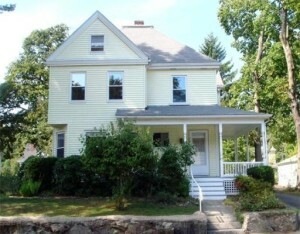 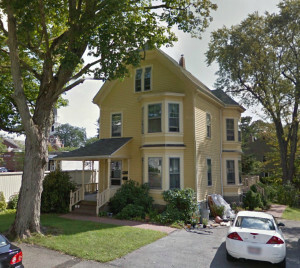 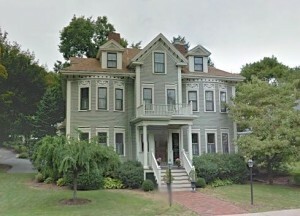 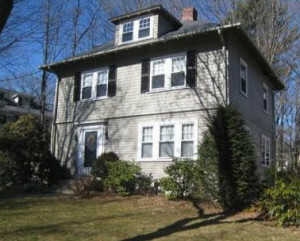 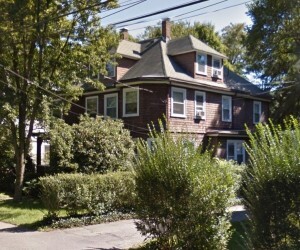 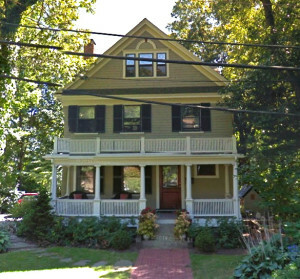 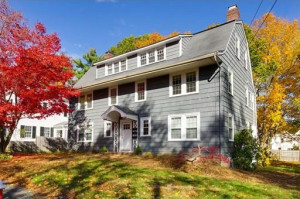 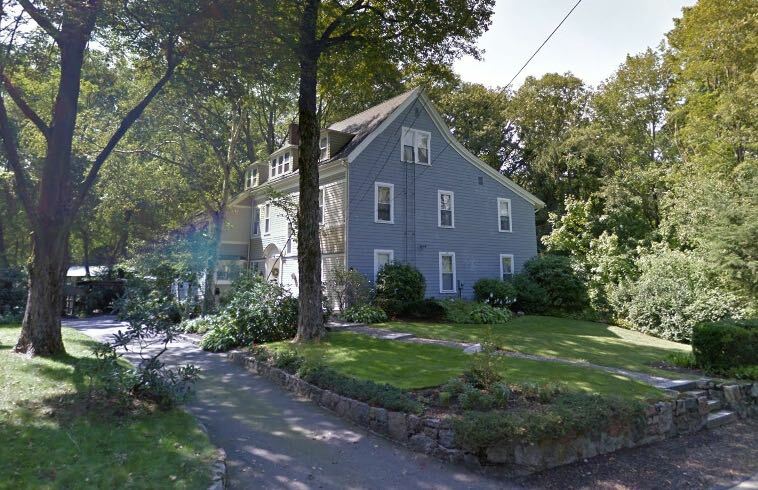 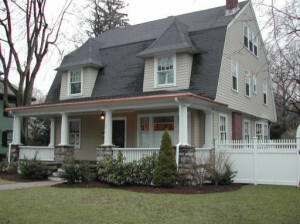 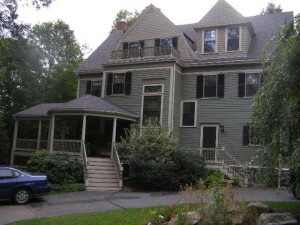 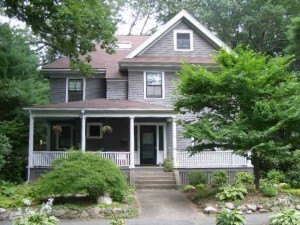 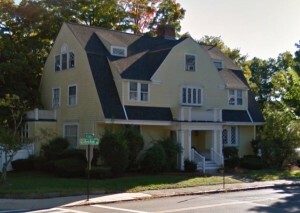 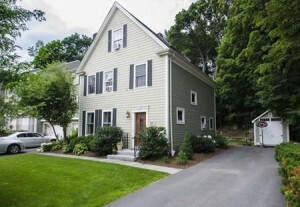 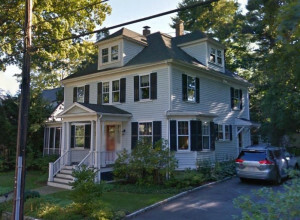 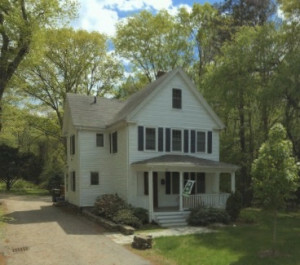 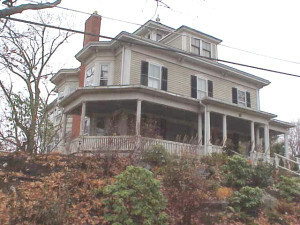 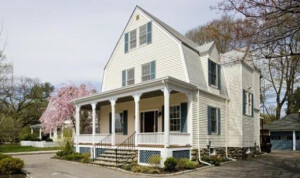 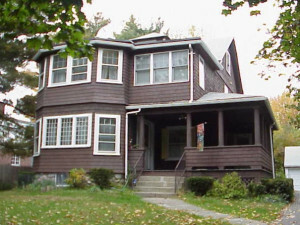 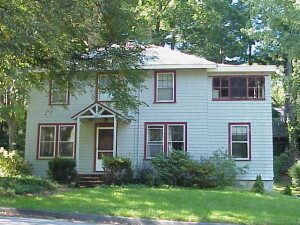 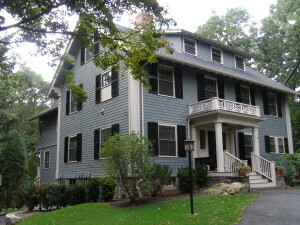 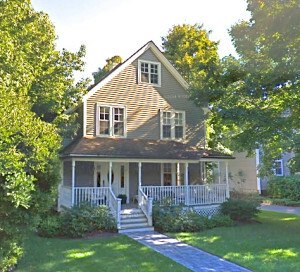 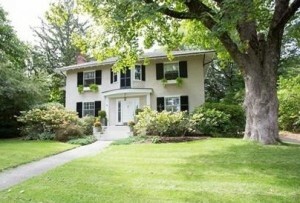 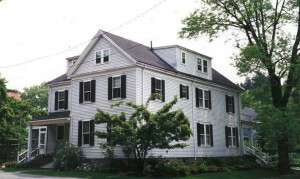 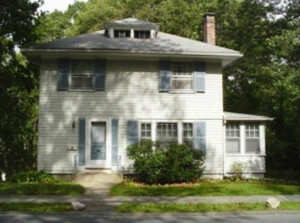 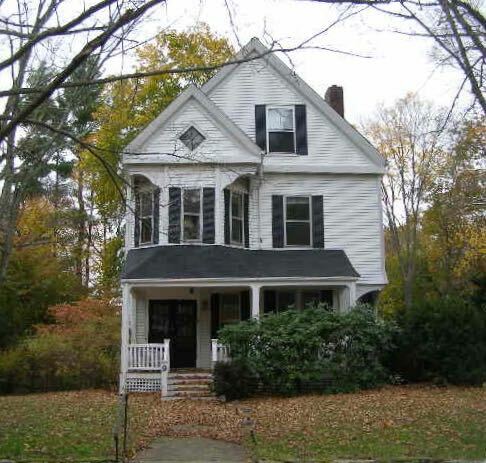 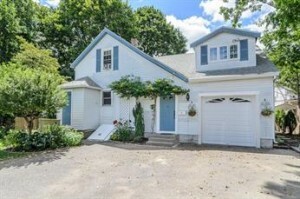 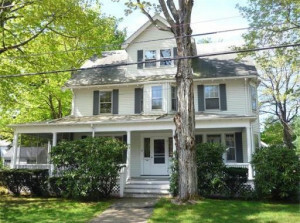 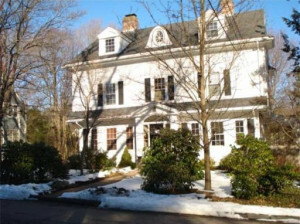 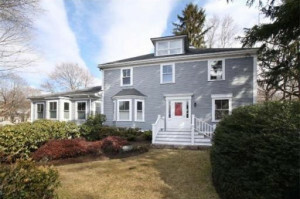 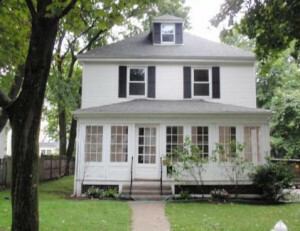 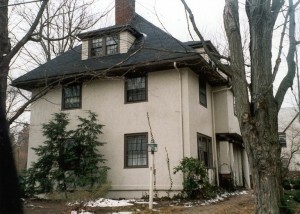 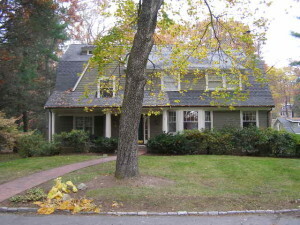 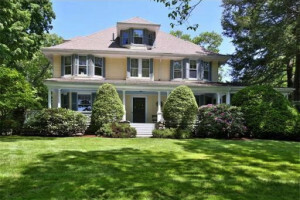 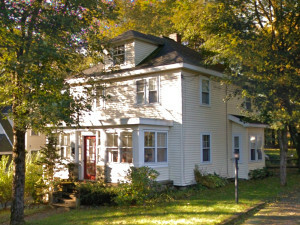 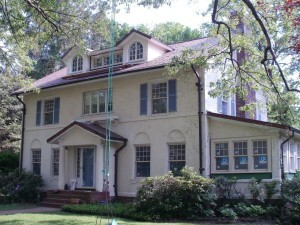 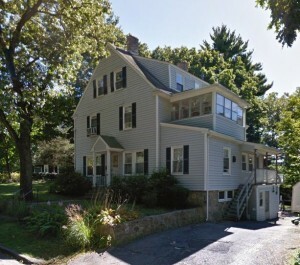 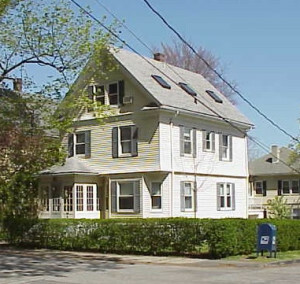 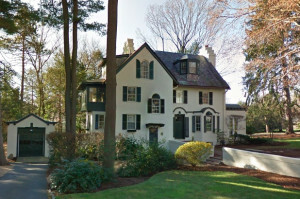 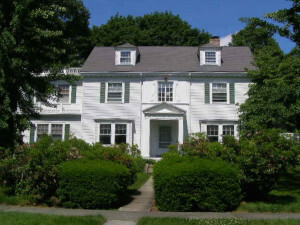 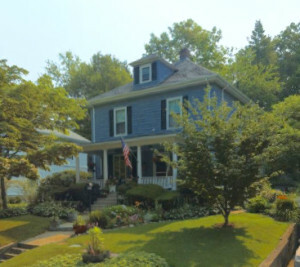 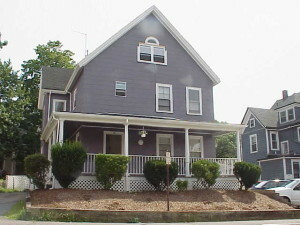 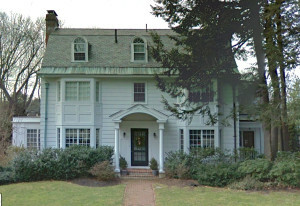 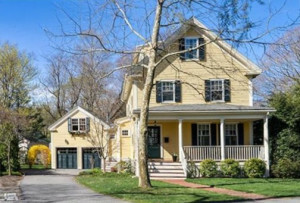 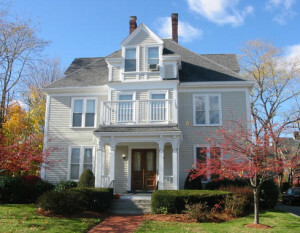 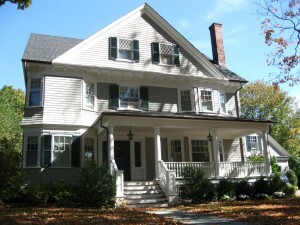 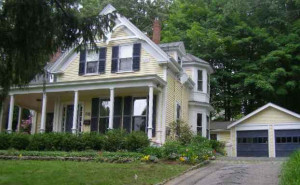 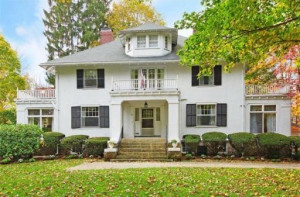 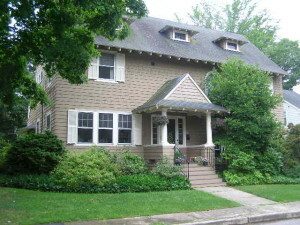 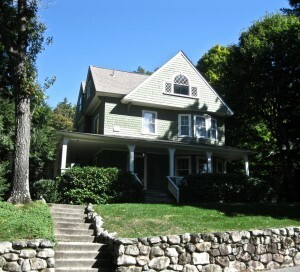 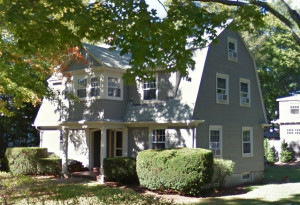 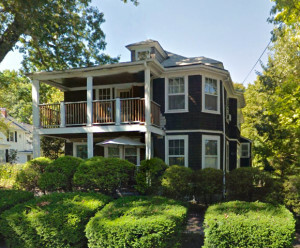 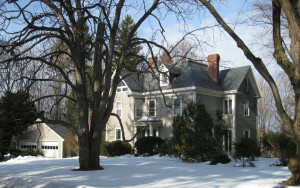 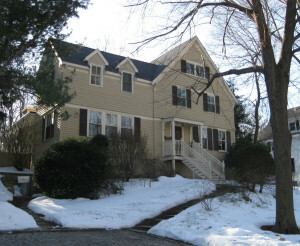 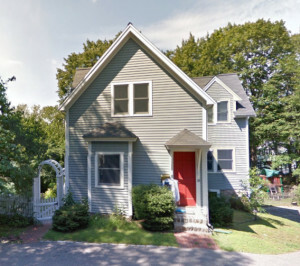 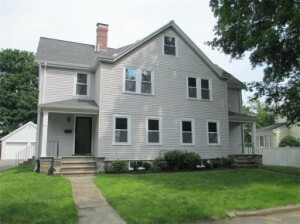 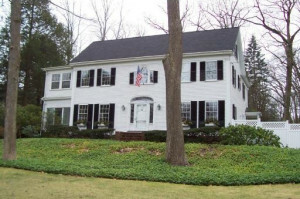 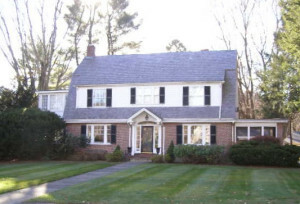 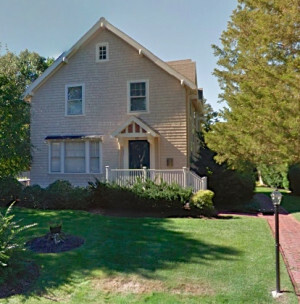 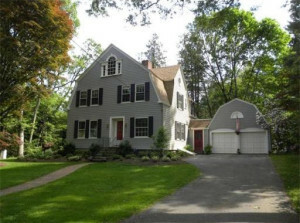 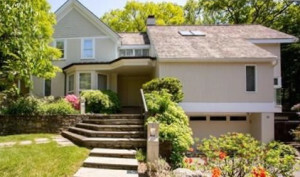 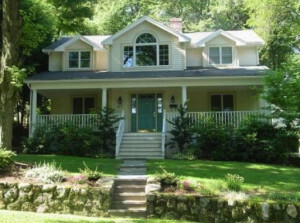 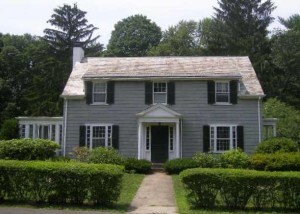 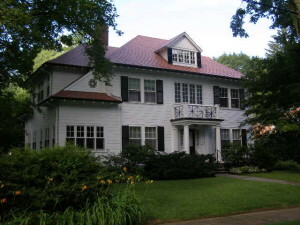 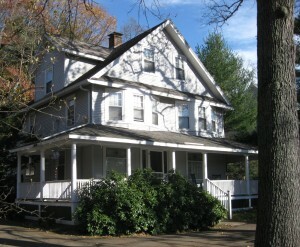 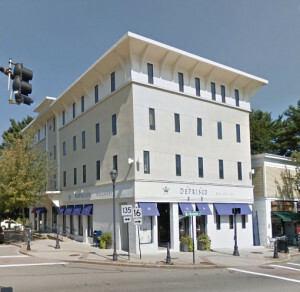 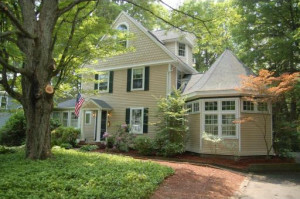 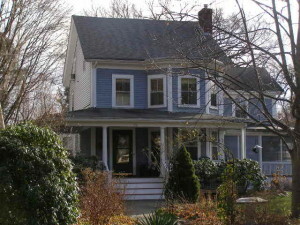 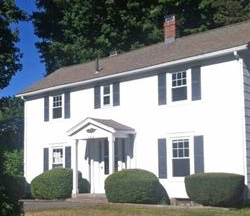 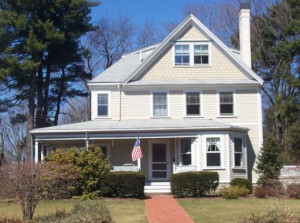 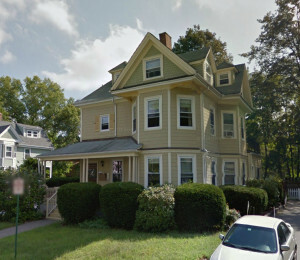 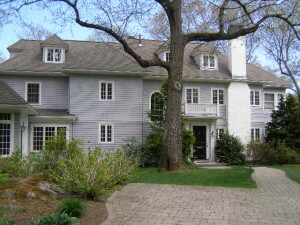 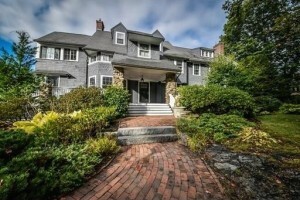 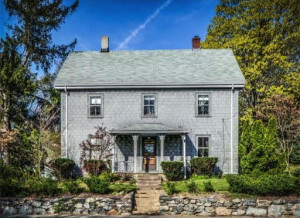 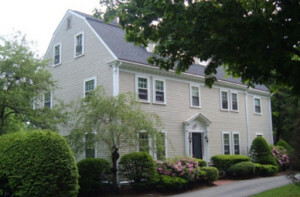 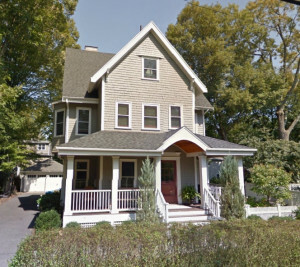 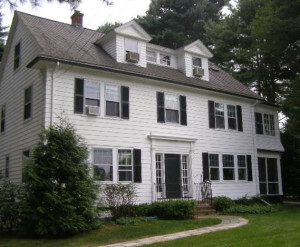 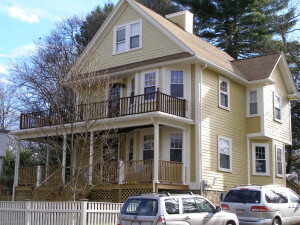 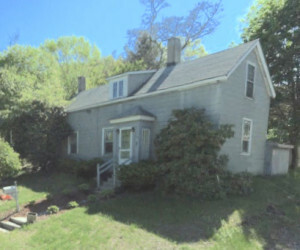 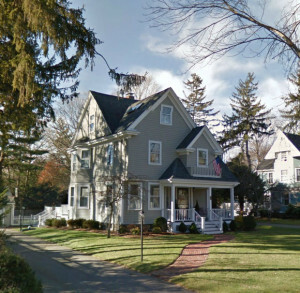 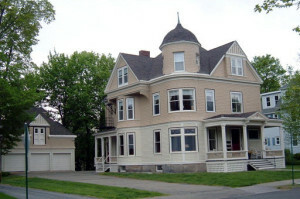 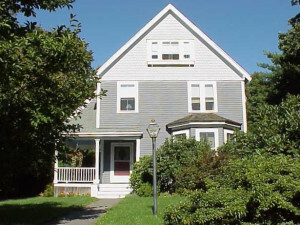 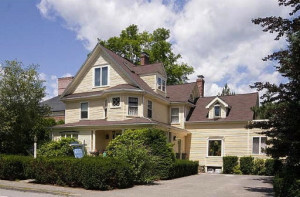 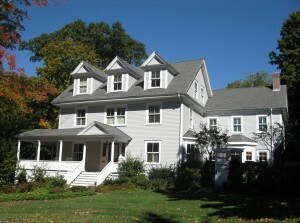 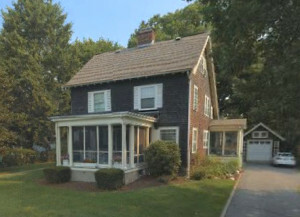 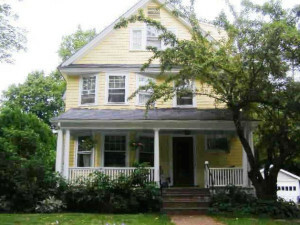 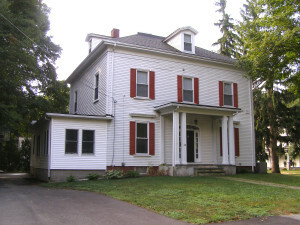 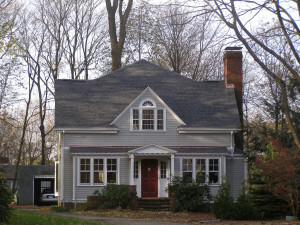 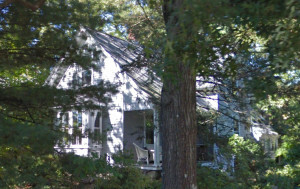 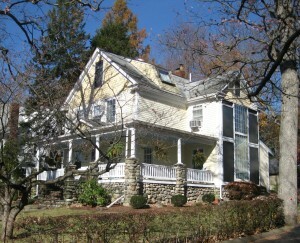 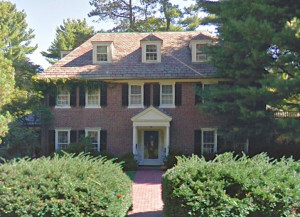 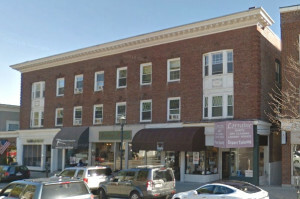 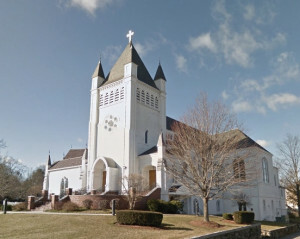 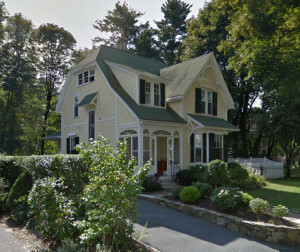 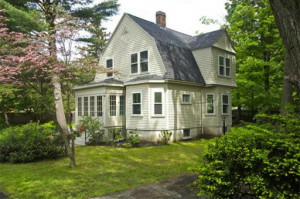 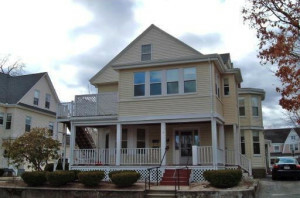 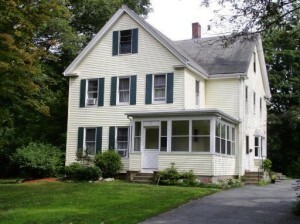 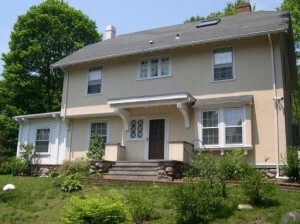 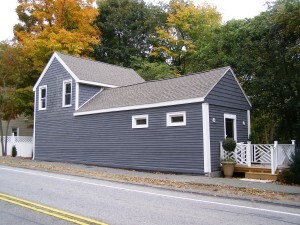 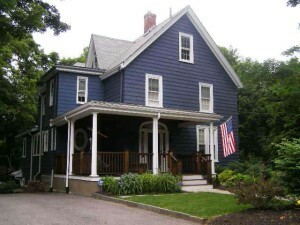 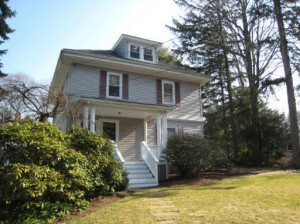 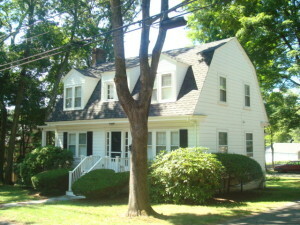 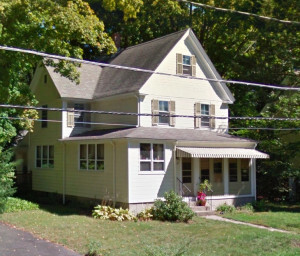 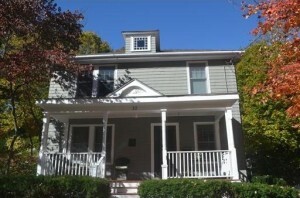 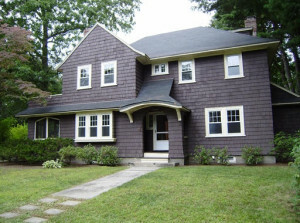 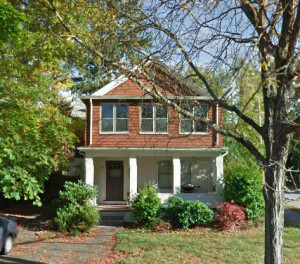 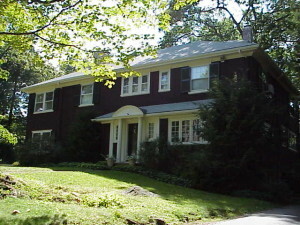 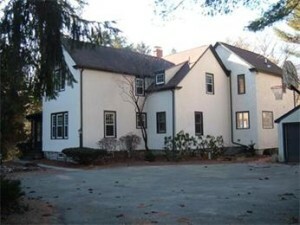 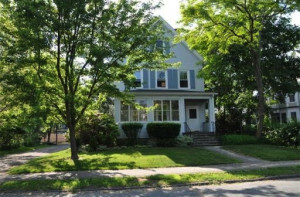 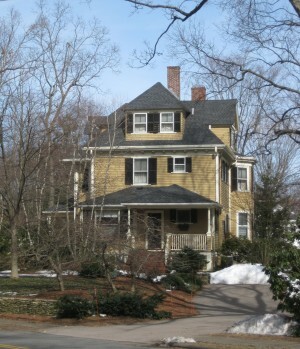 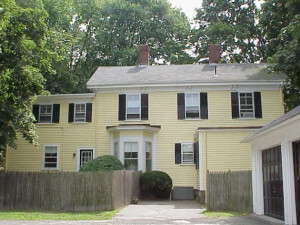 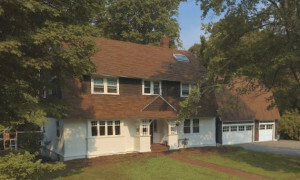 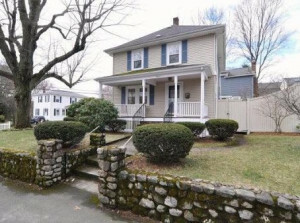 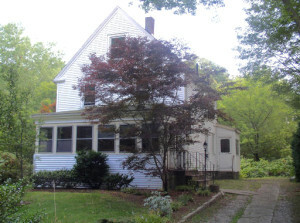 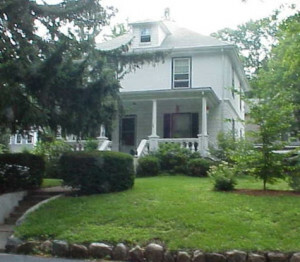 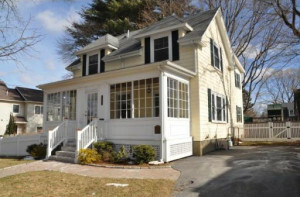 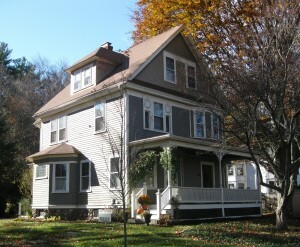 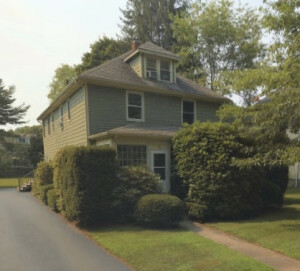 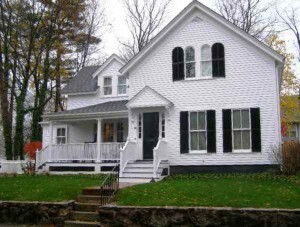 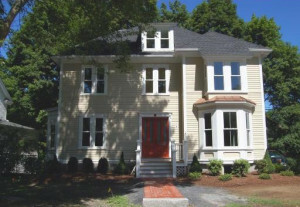 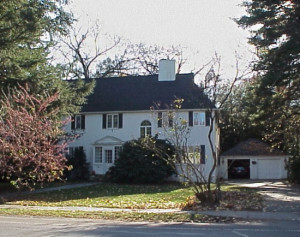 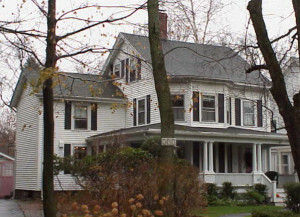 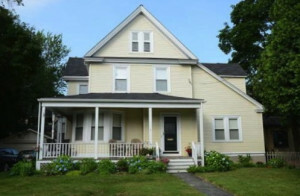 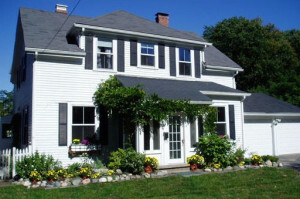 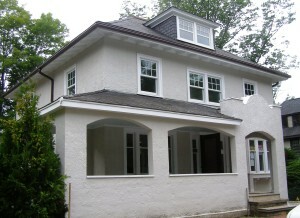 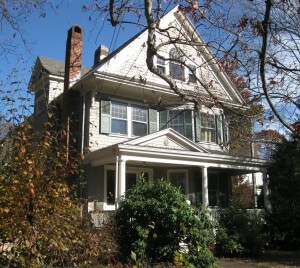 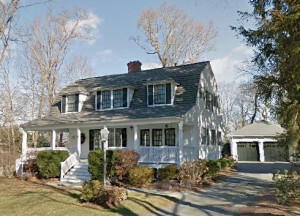 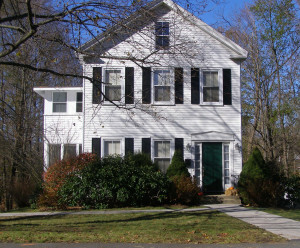 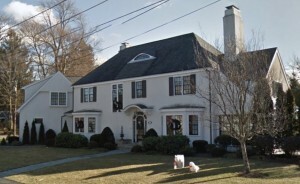 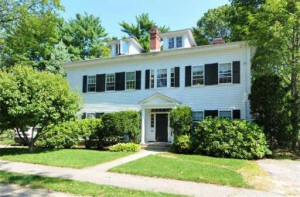 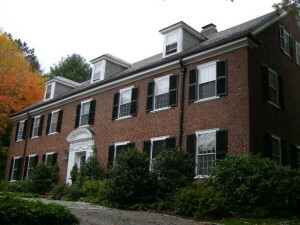 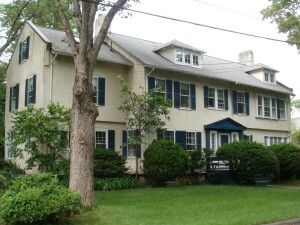 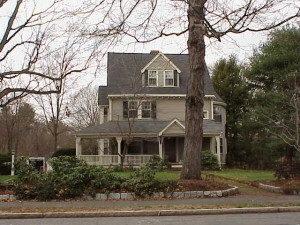 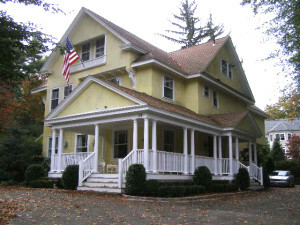 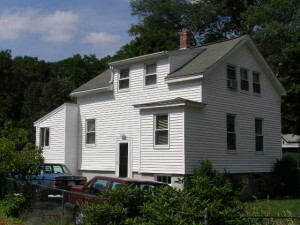 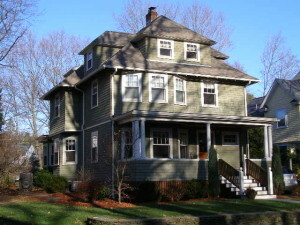 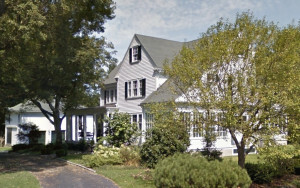 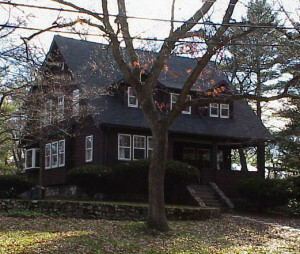 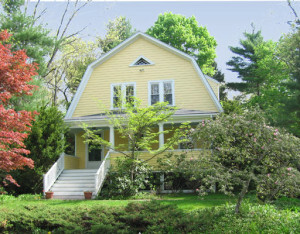 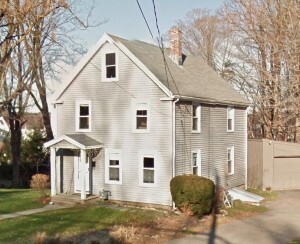 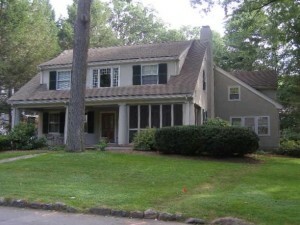 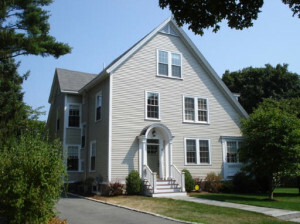 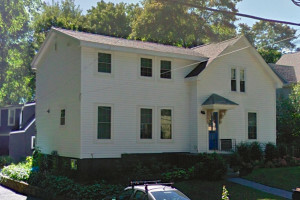 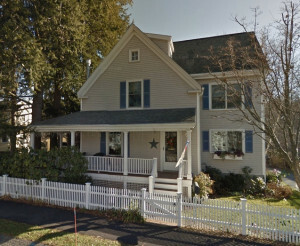 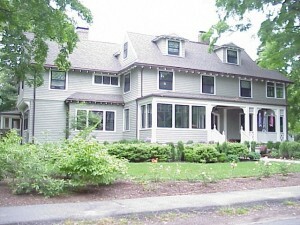 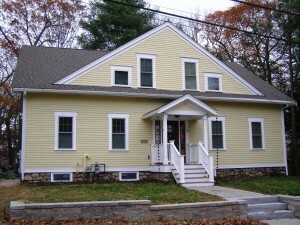 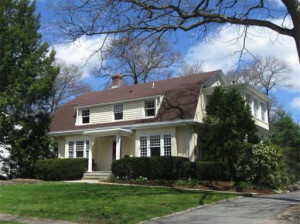 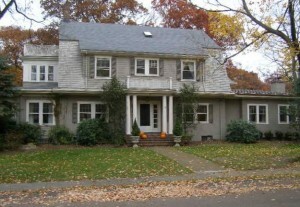 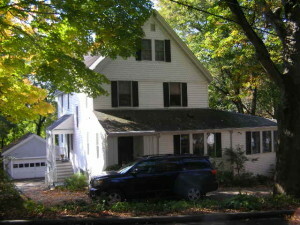 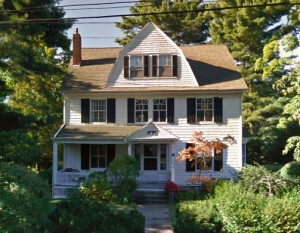 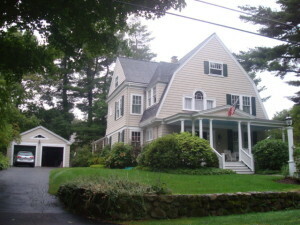 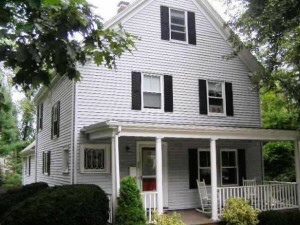 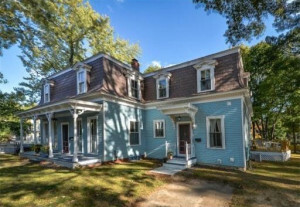 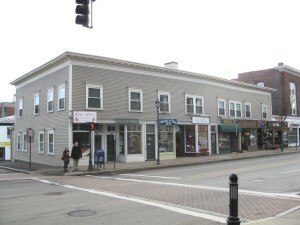 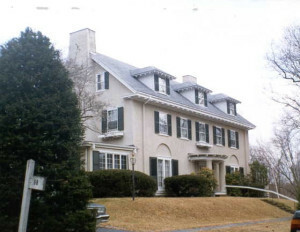 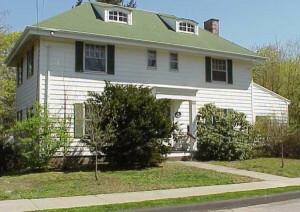 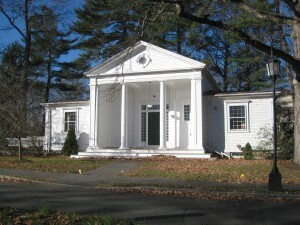 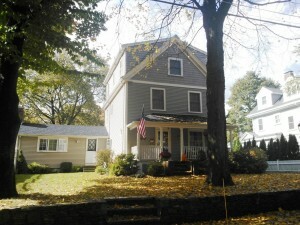 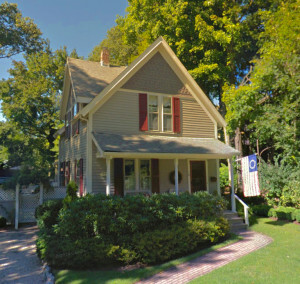 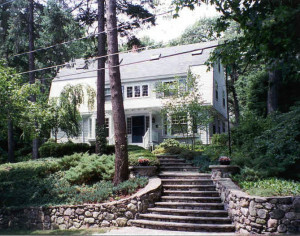 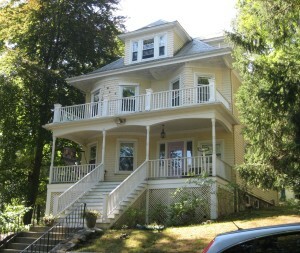 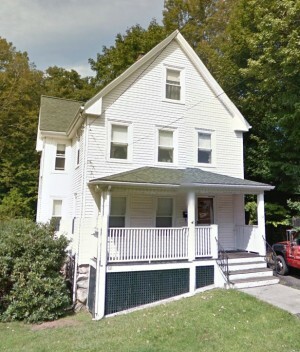 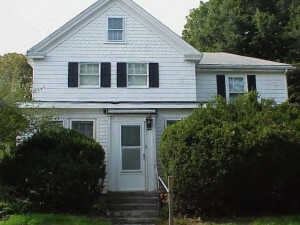 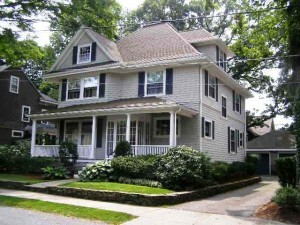 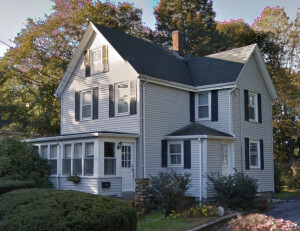 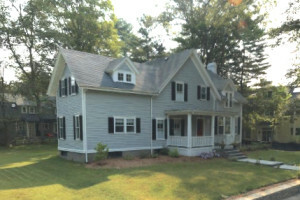 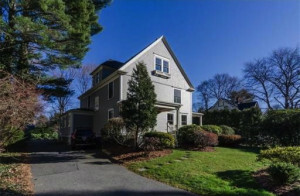 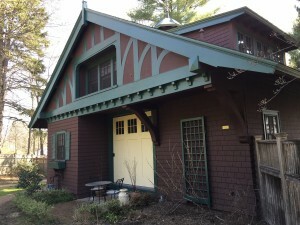 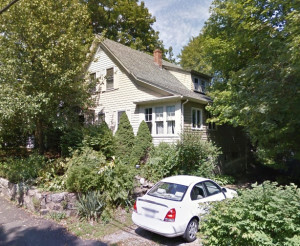 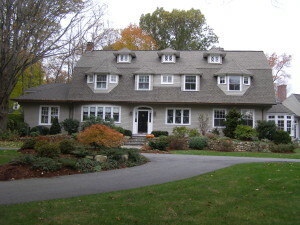 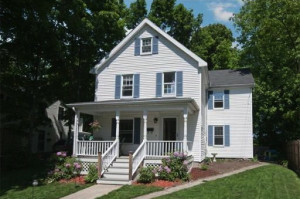 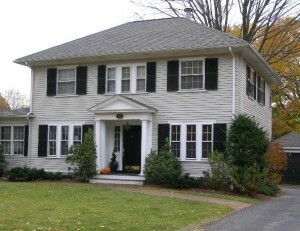 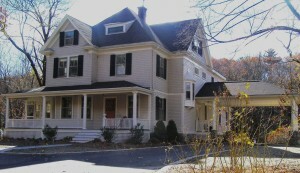 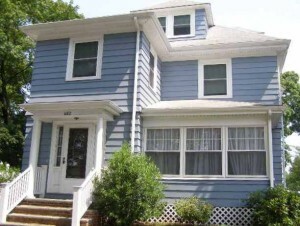 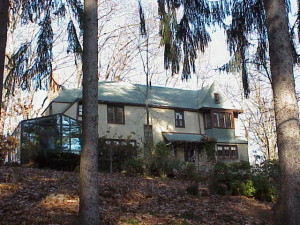 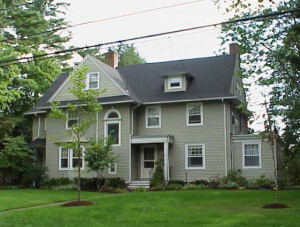 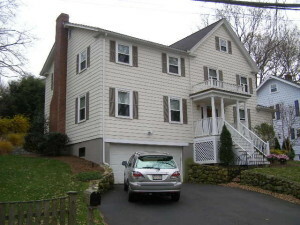 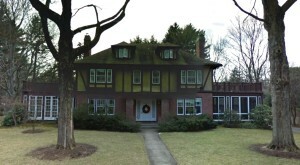 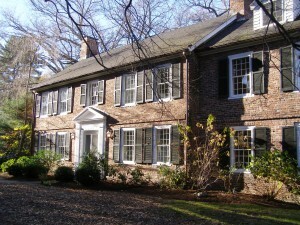 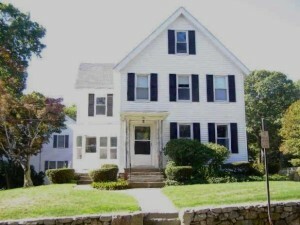 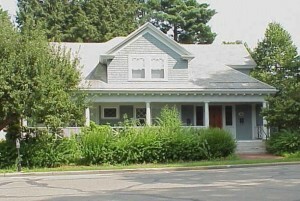 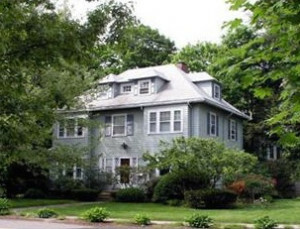 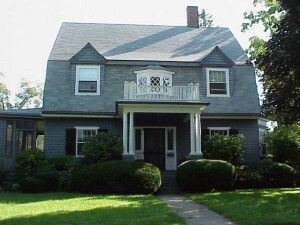 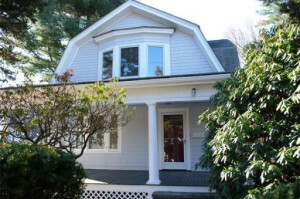 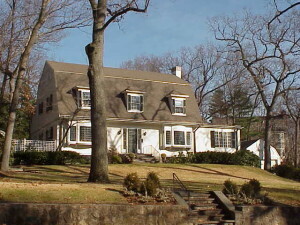 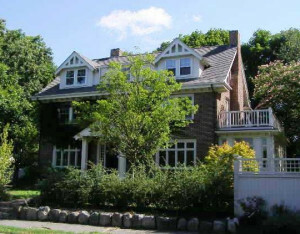 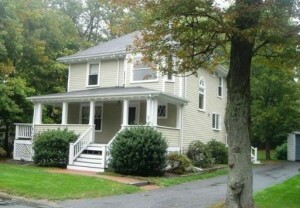 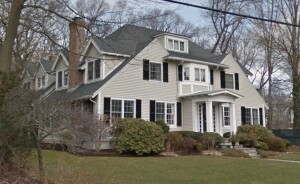 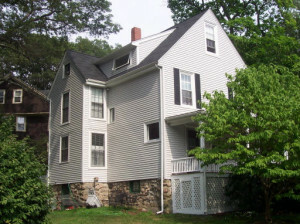 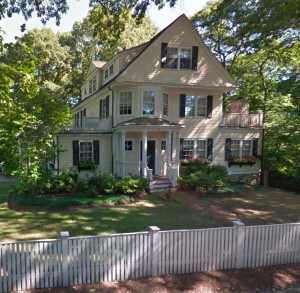 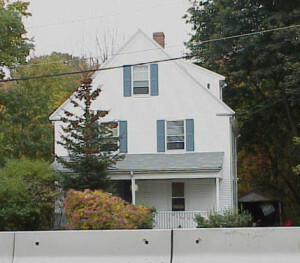 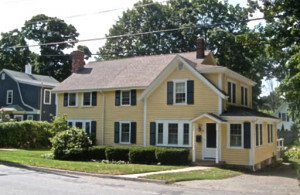 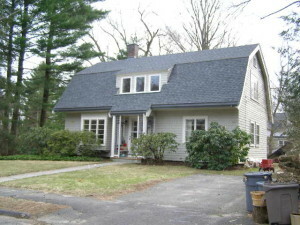 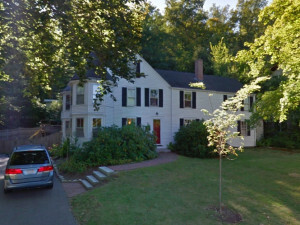 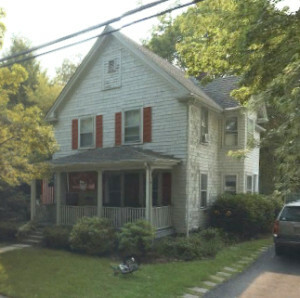 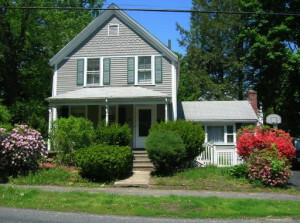 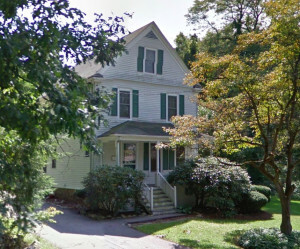 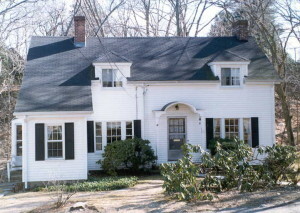 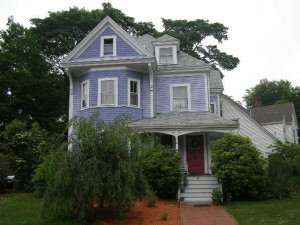 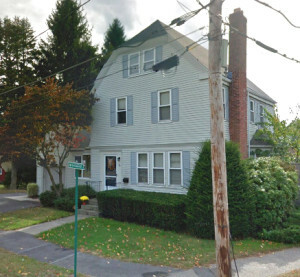 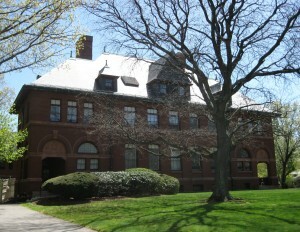 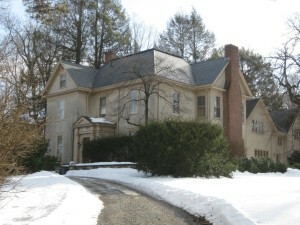 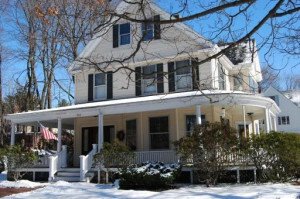 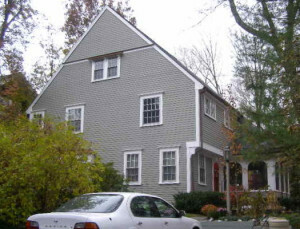 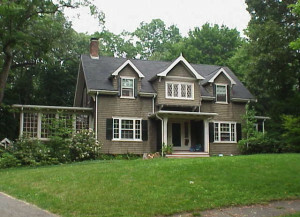 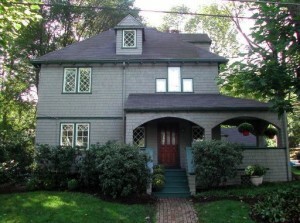 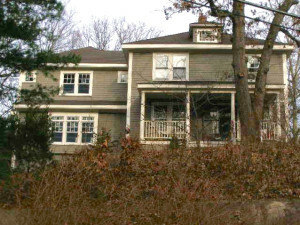 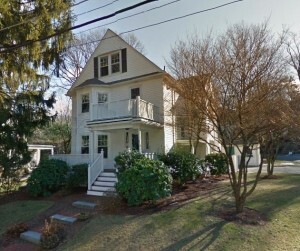 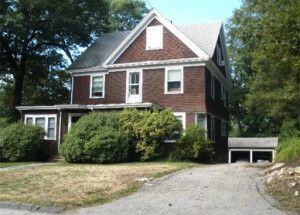 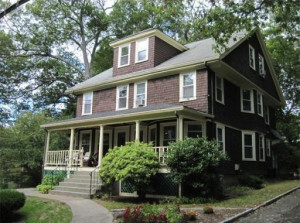 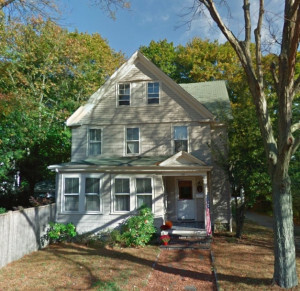 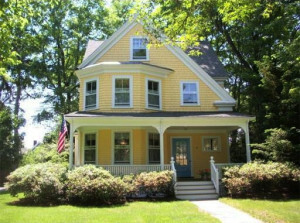 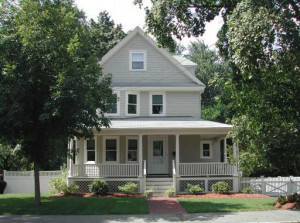 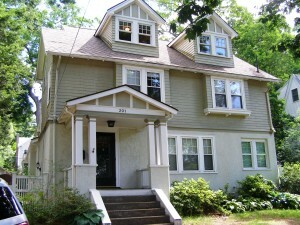 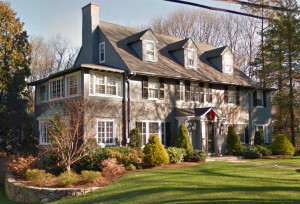 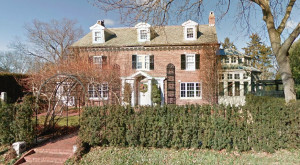 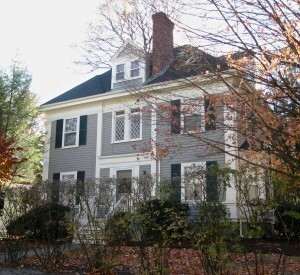 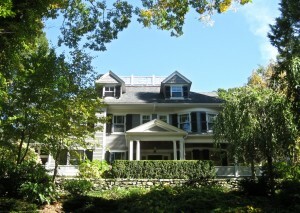 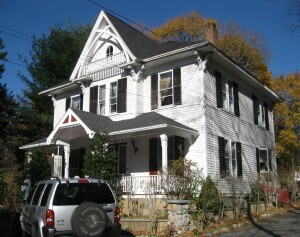 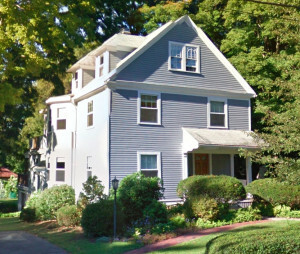 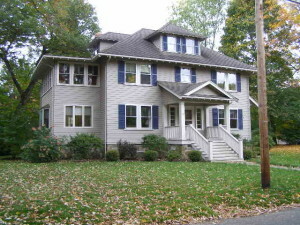 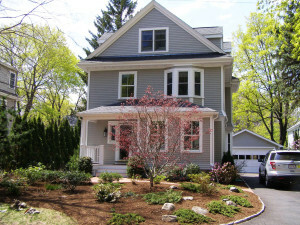 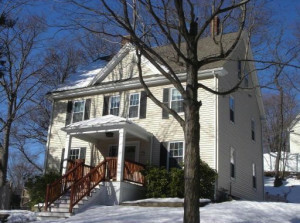 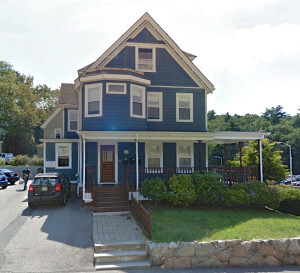 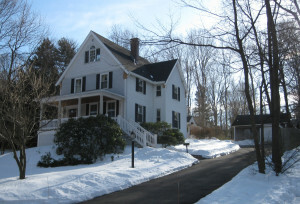 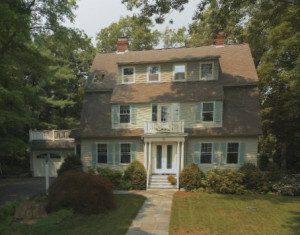 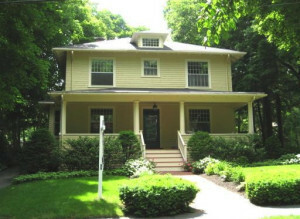 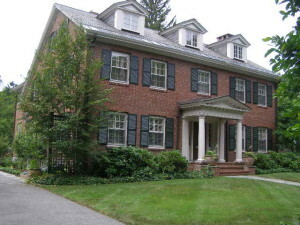 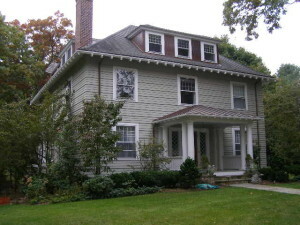 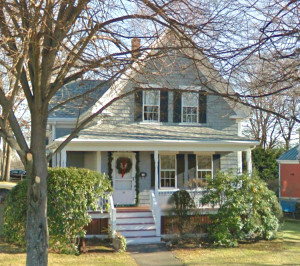 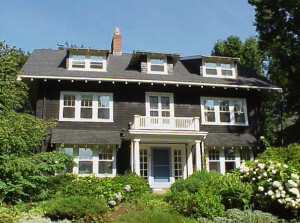 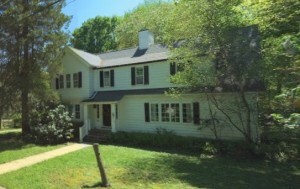 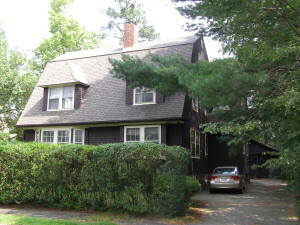 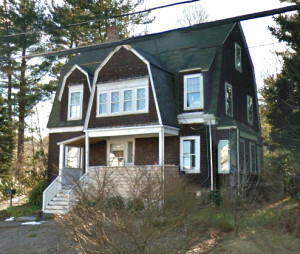 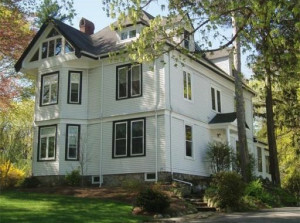 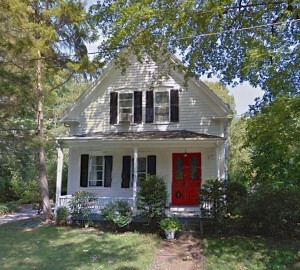 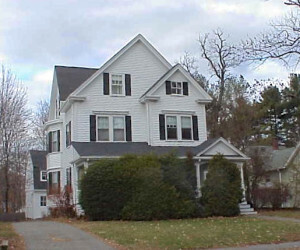 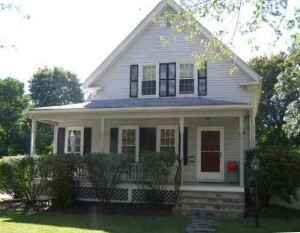 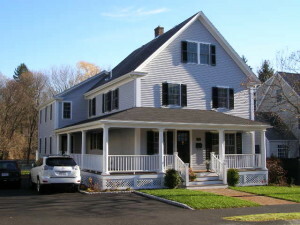 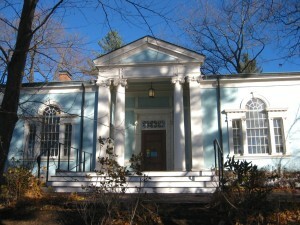 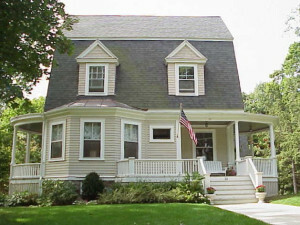 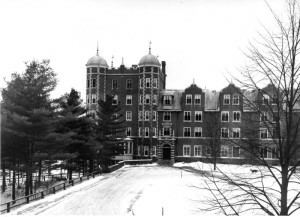 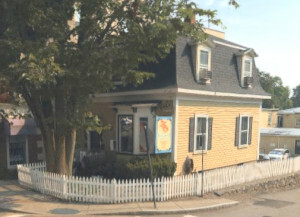 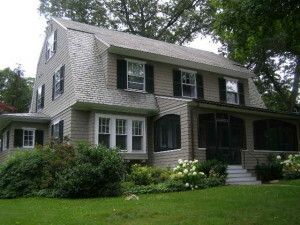 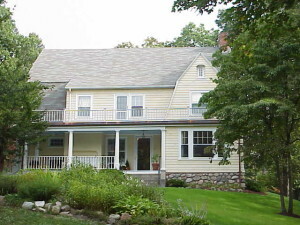 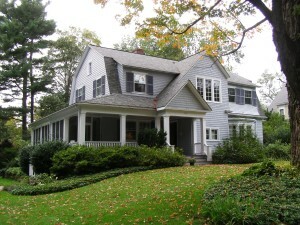 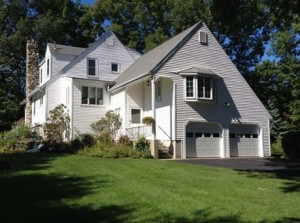 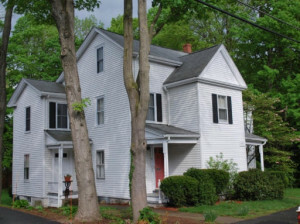 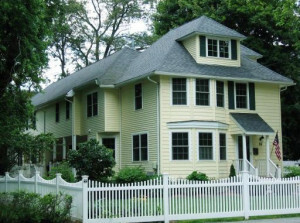 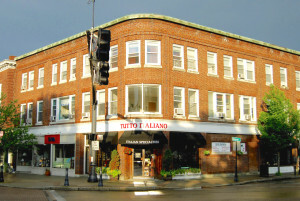 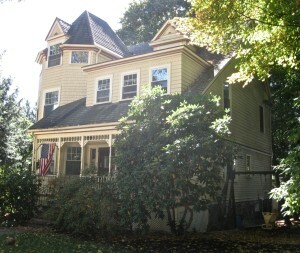 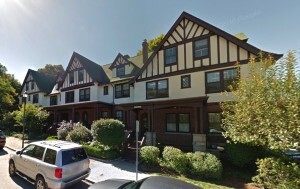 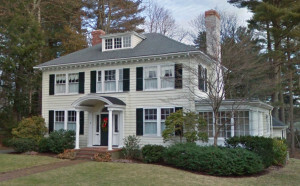 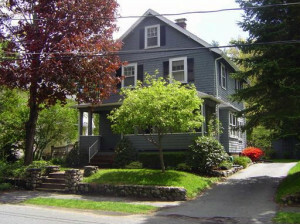 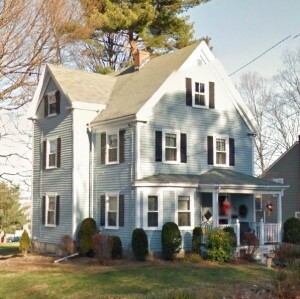 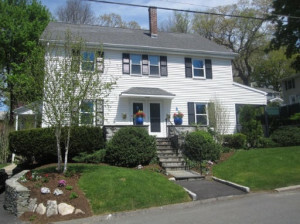 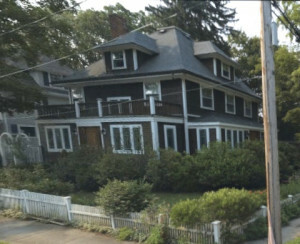 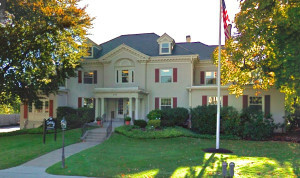 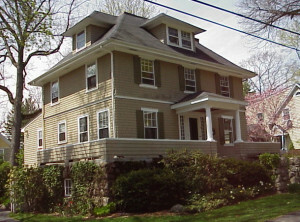 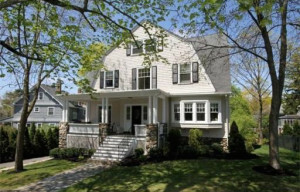 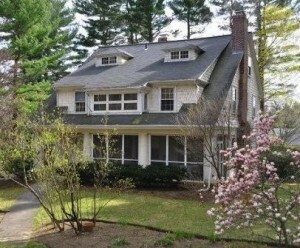 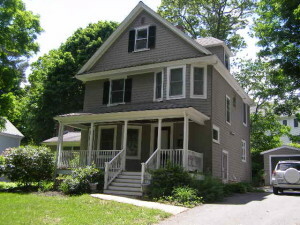 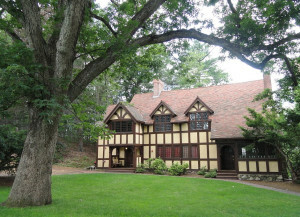 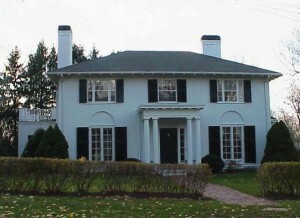 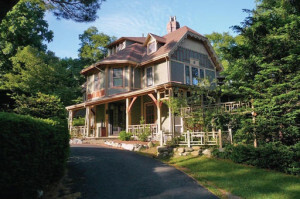 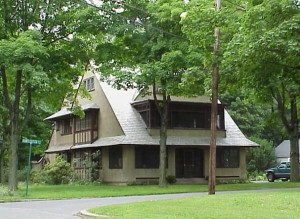 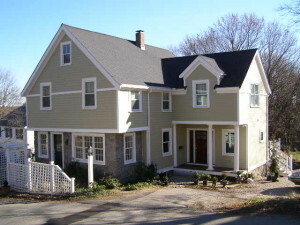 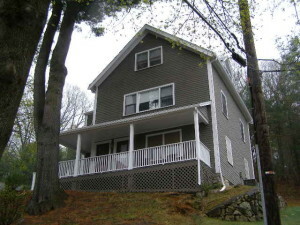 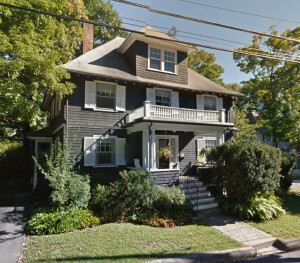 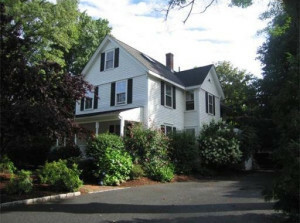 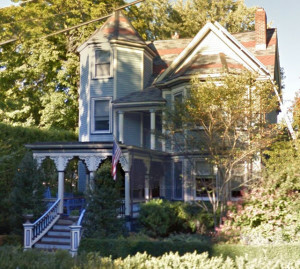 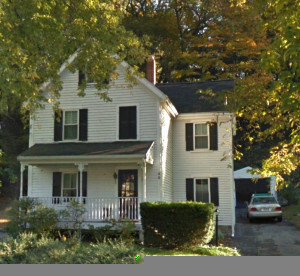 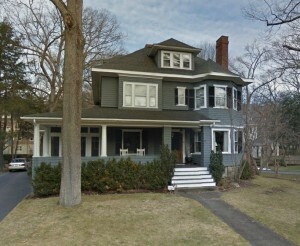 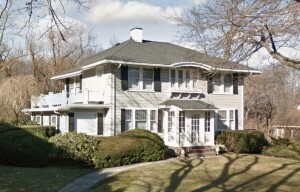 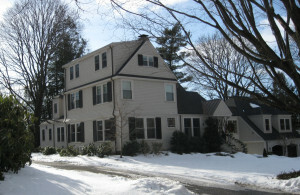 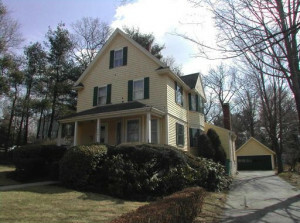 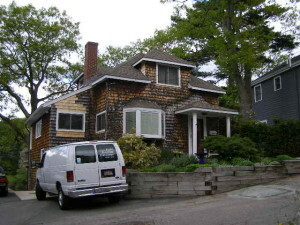 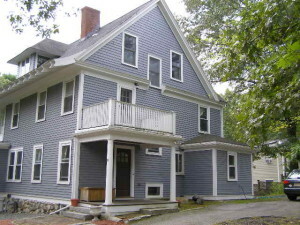 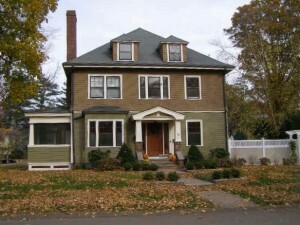 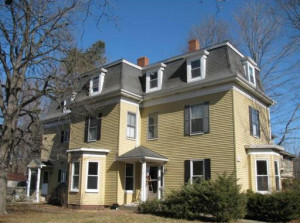 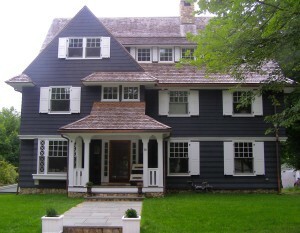 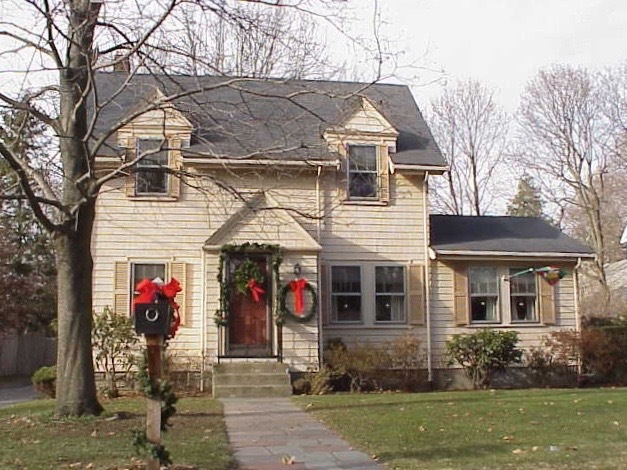 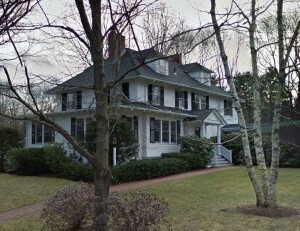 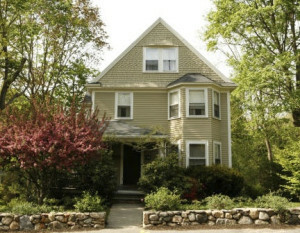 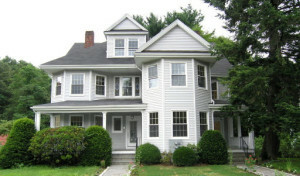 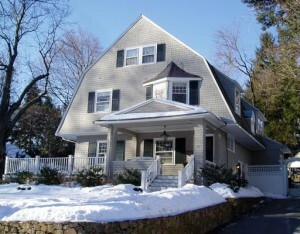 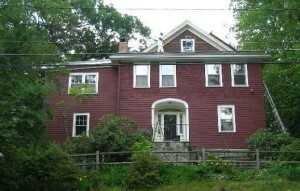 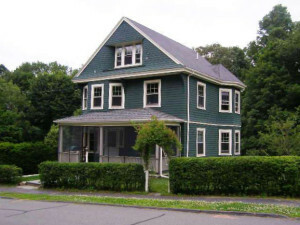 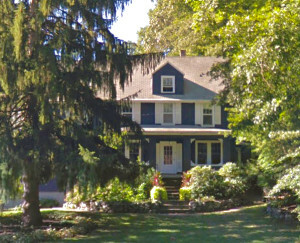 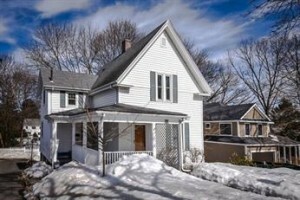 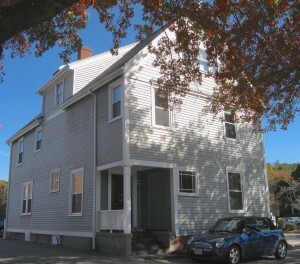 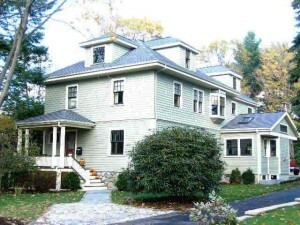 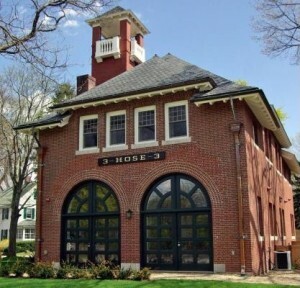 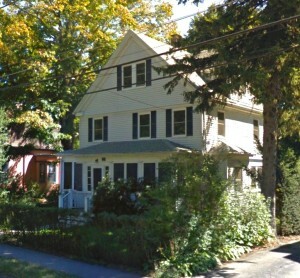 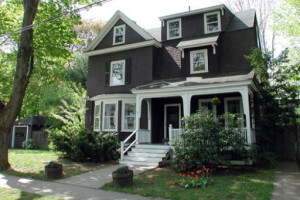 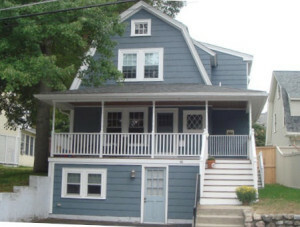 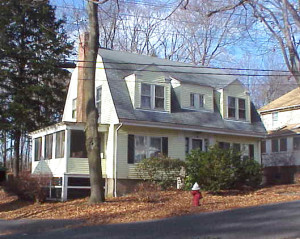 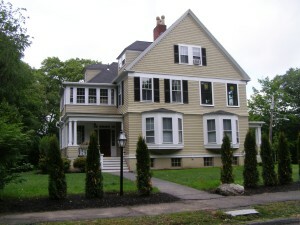 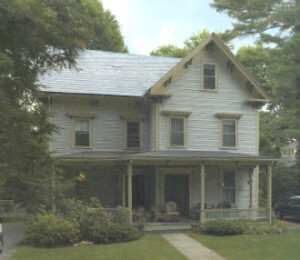 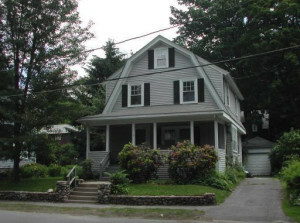 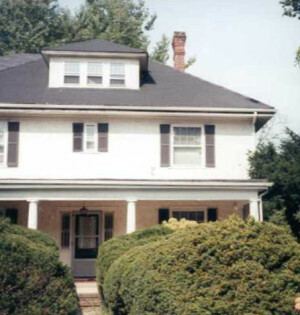 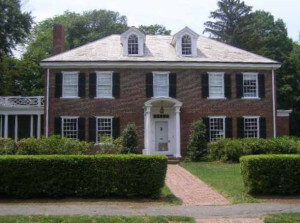 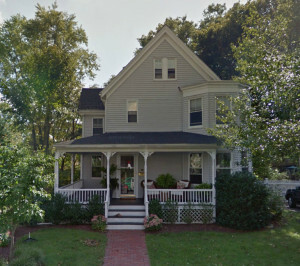 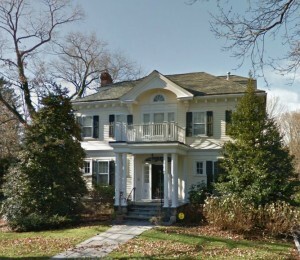 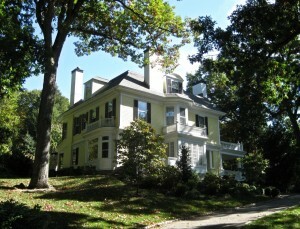 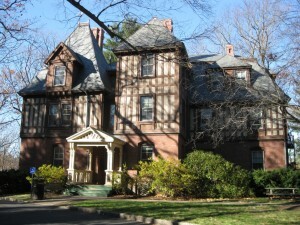 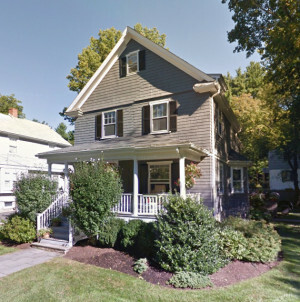 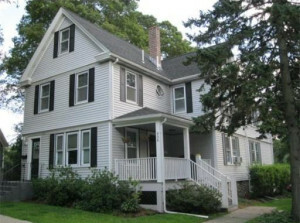 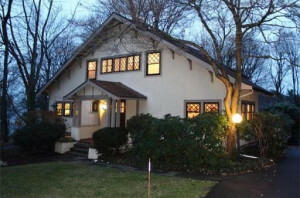 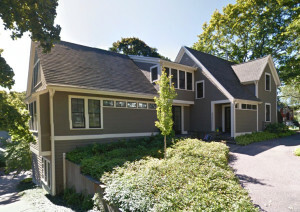 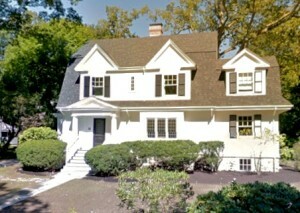 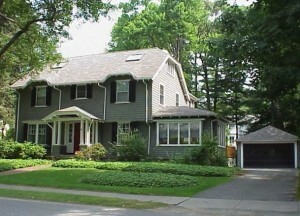 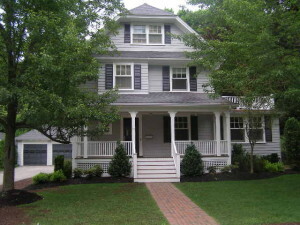 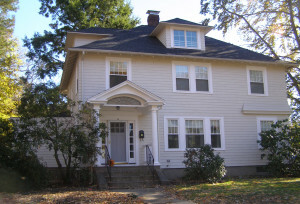 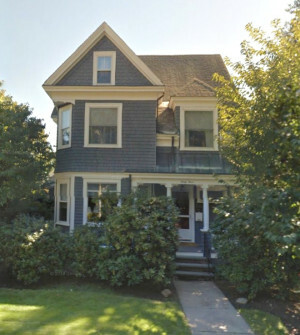 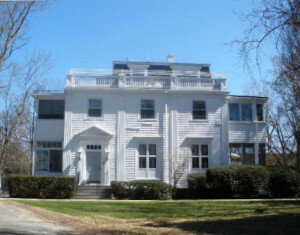 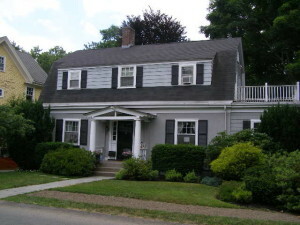 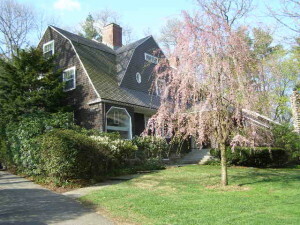 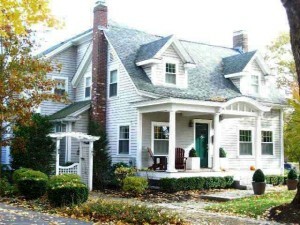 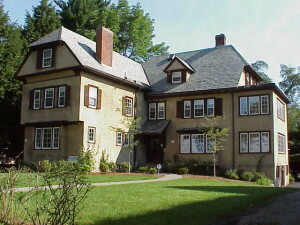 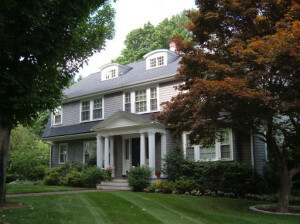 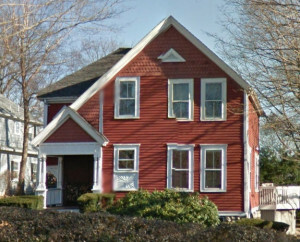 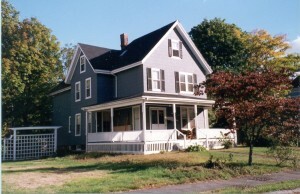 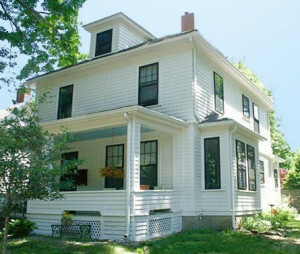 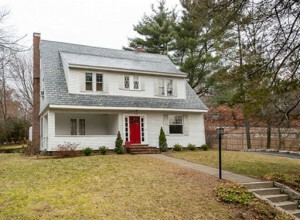 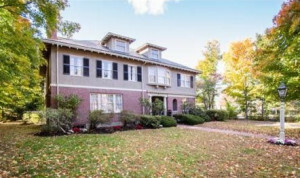 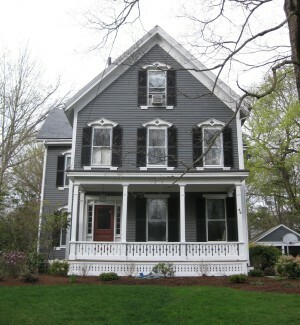 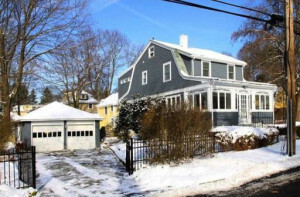 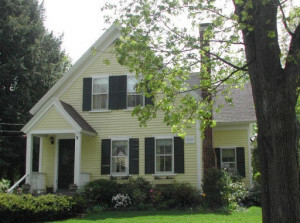 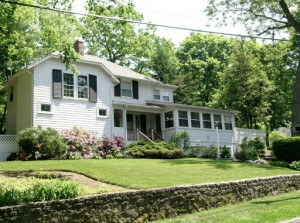 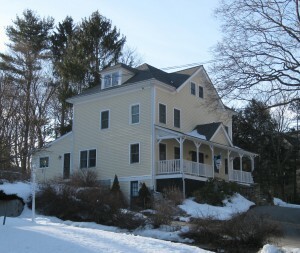 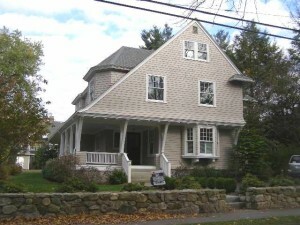 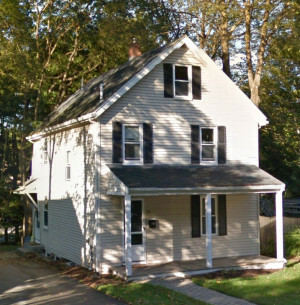 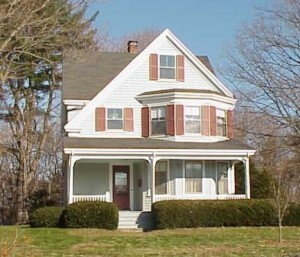 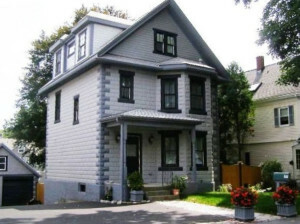 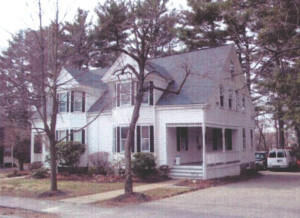 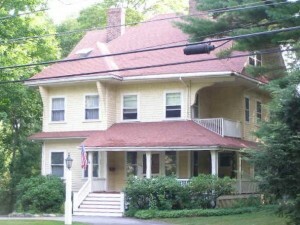 In 2014, the Historical Commission extended the cutoff date for the plaques to 1914, thus permitting the placement of plaques on all houses and buildings in Wellesley constructed 100 or more years ago. 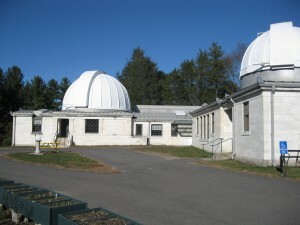 This cutoff date will advance each year through 2019 (e.g. 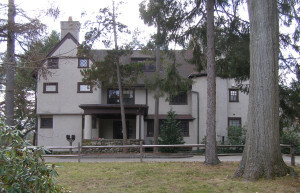 in 2015, the cutoff date is 1915). 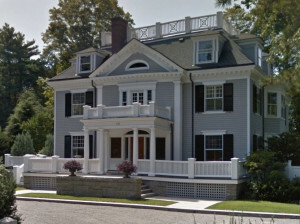 Bill and Carol Mone of 75 Abbott Road recently shared their pride in affixing a new plaque to their beautiful home, one of the original Belvedere houses built in 1901. 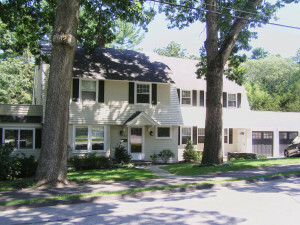 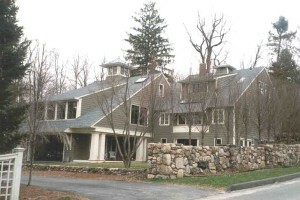 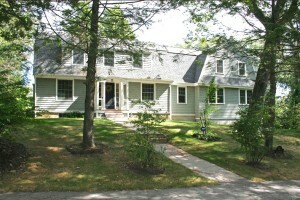 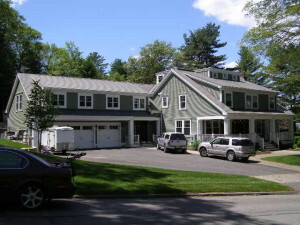 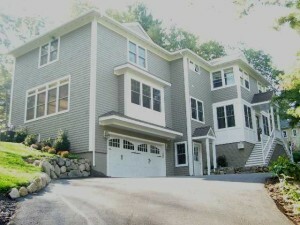 Their house was the first in Wellesley to receive a plaque under the new plaque program, and the Mones encourage all applicable residents to consider such a plaque. 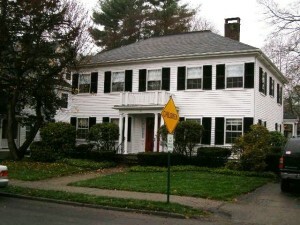 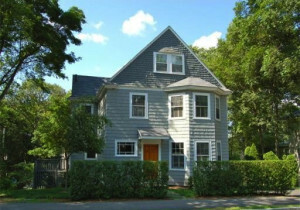 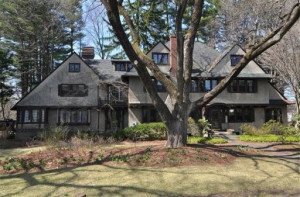 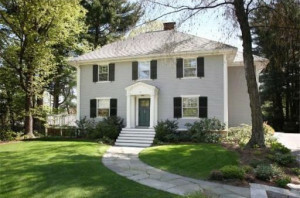 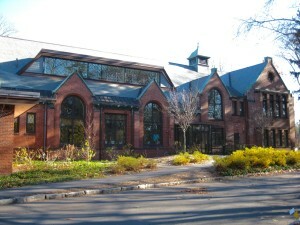 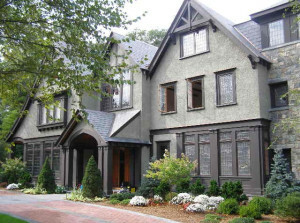 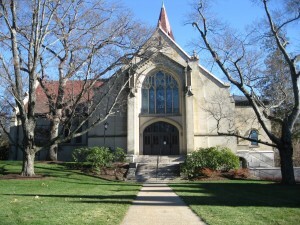 If you believe your house or building qualifies for a plaque under the new expanded program, please review the “Wellesley Historical Commission Plaque Summary” informational document (PDF) and then contact Joshua Dorin of the Historical Commission at plaques@wellesleyhistoricalcommission.org. 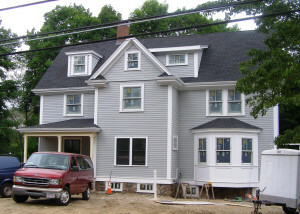 The Historical Commission will then research the construction date of your home and contact you to confirm your eligibility. 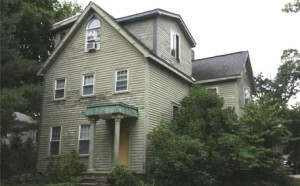 The Historical Commission is currently conducting research to determine what properties are eligible for plaques under the newly-expanded program (thru 2019). 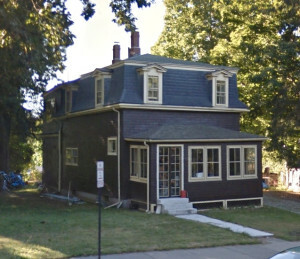 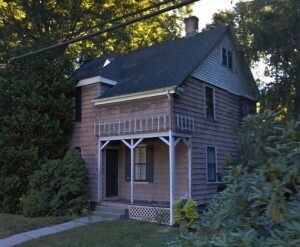 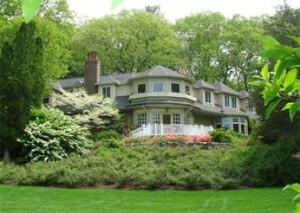 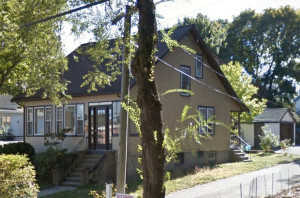 Many of these homes and buildings — 762 in total — have been uploaded to the following online database. 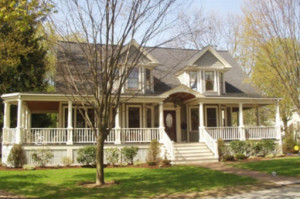 If your property does not appear in the database it does not mean that it is not eligible. 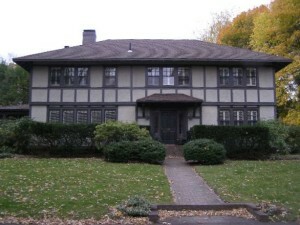 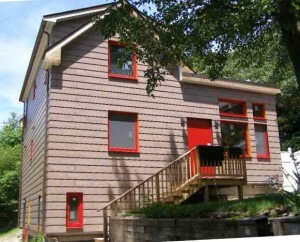 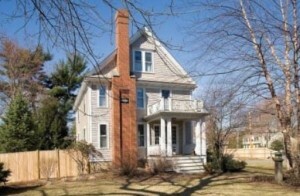 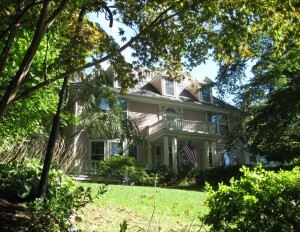 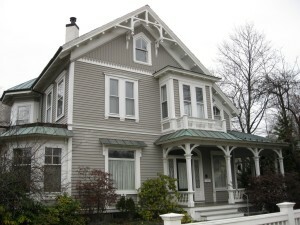 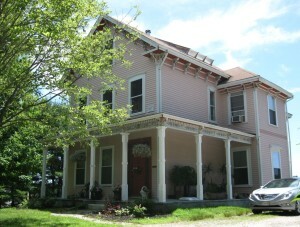 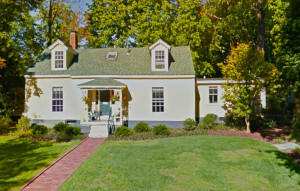 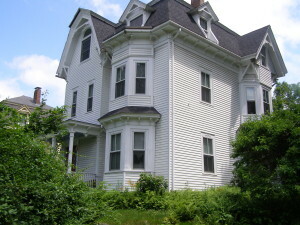 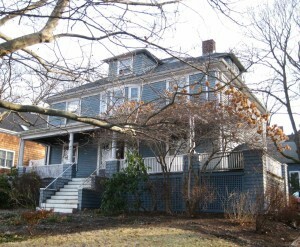 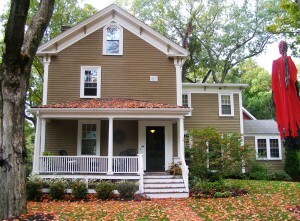 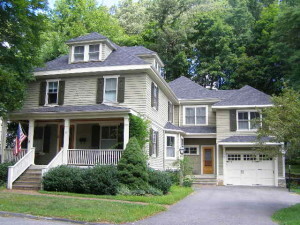 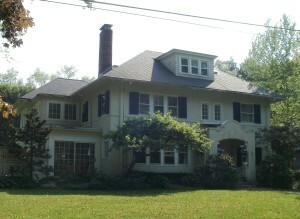 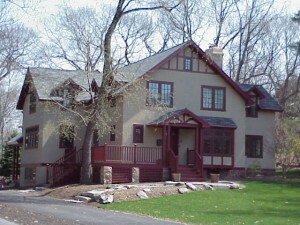 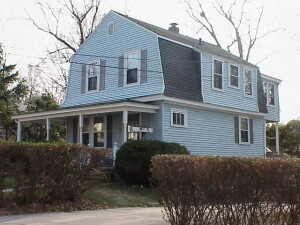 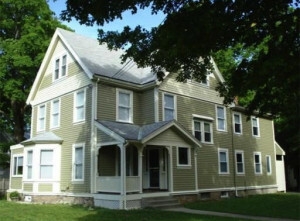 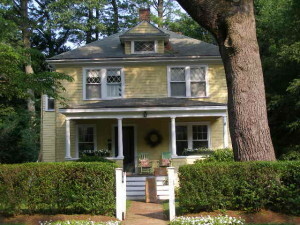 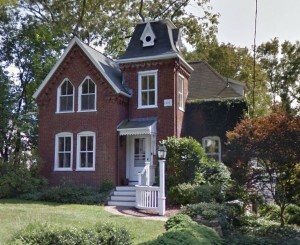 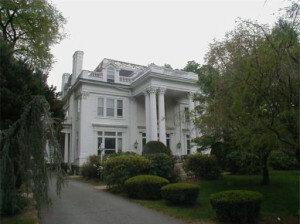 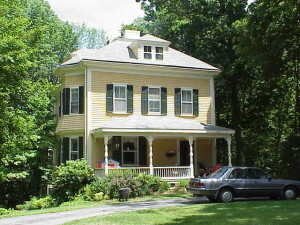 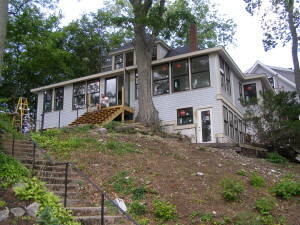 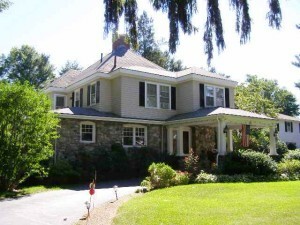 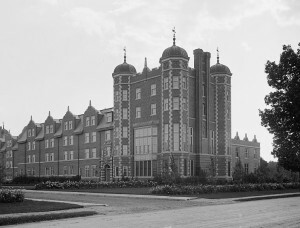 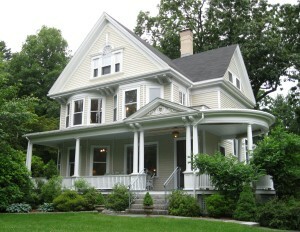 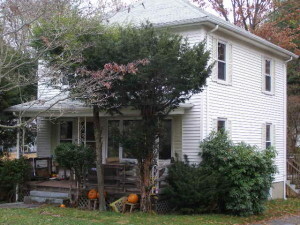 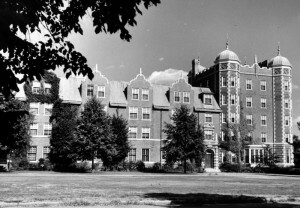 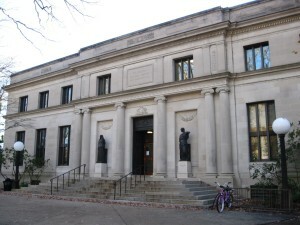 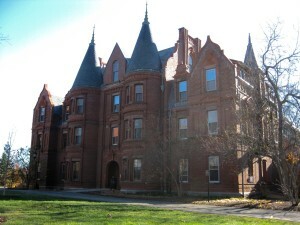 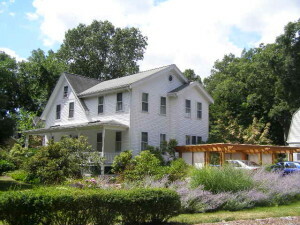 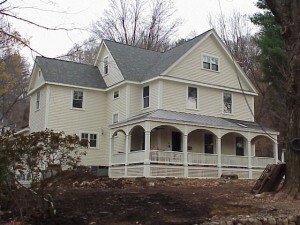 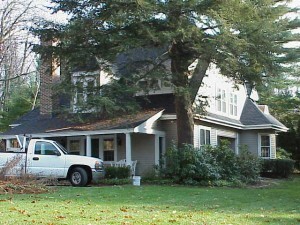 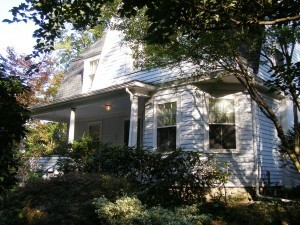 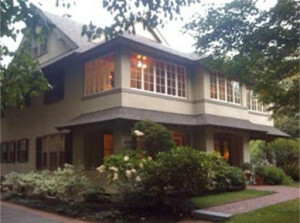 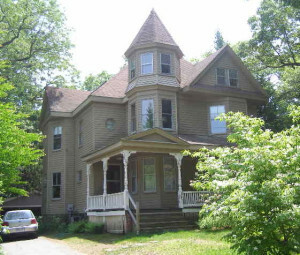 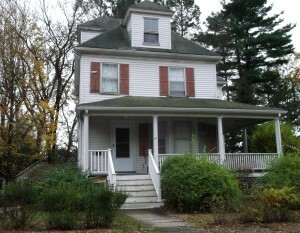 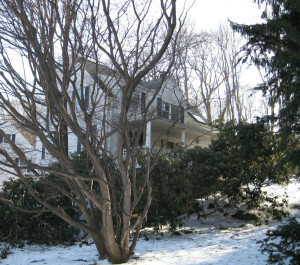 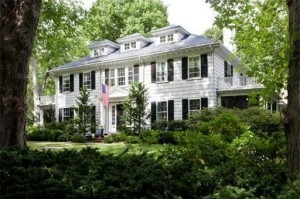 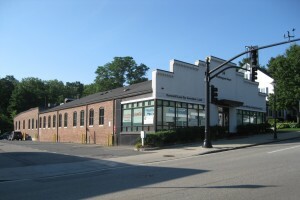 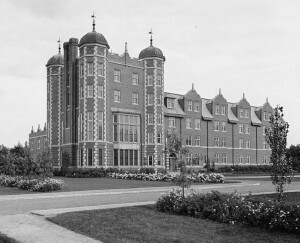 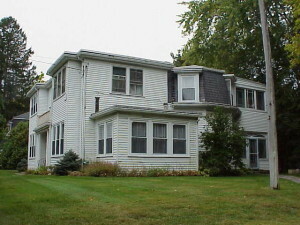 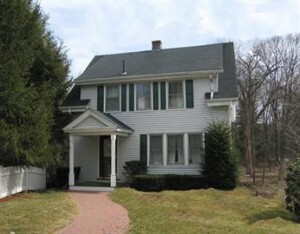 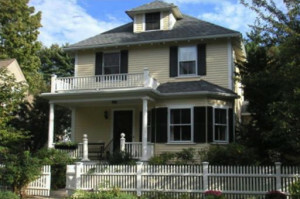 The Historical Commission is continually working to add more properties to this database. 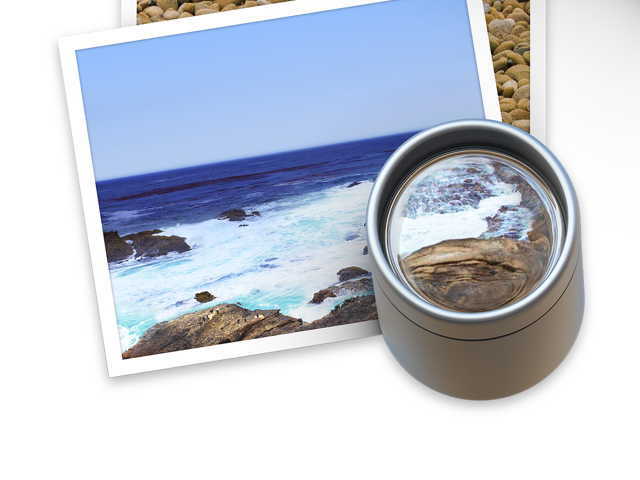 Please use the search box below to explore the database. 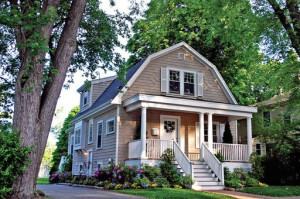 Simply start typing part of the street number, street name and/or year constructed to filter the results.